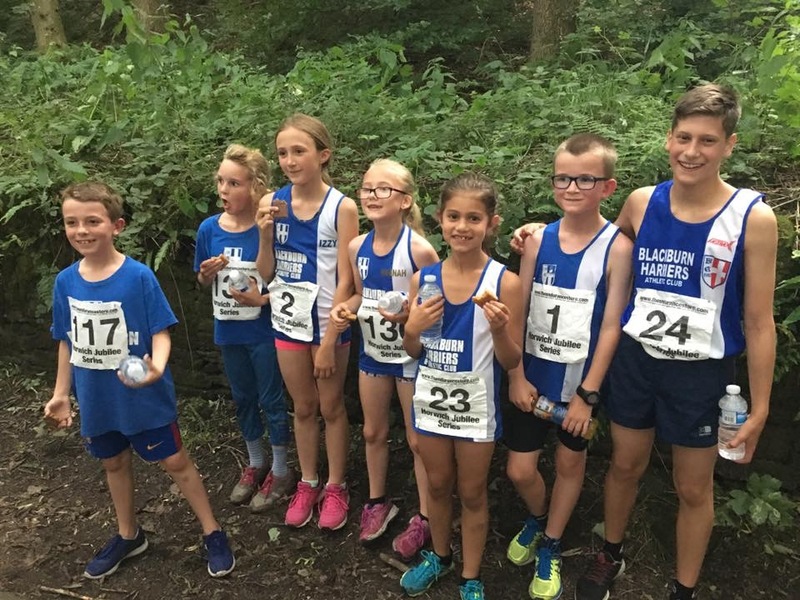 The penultimate fixture of this years Mid Lancs League took place at Litherland at the weekend, the last fixture before the Medal meeting which takes place at Stanley Park, Blackpool on Saturday August 26th. 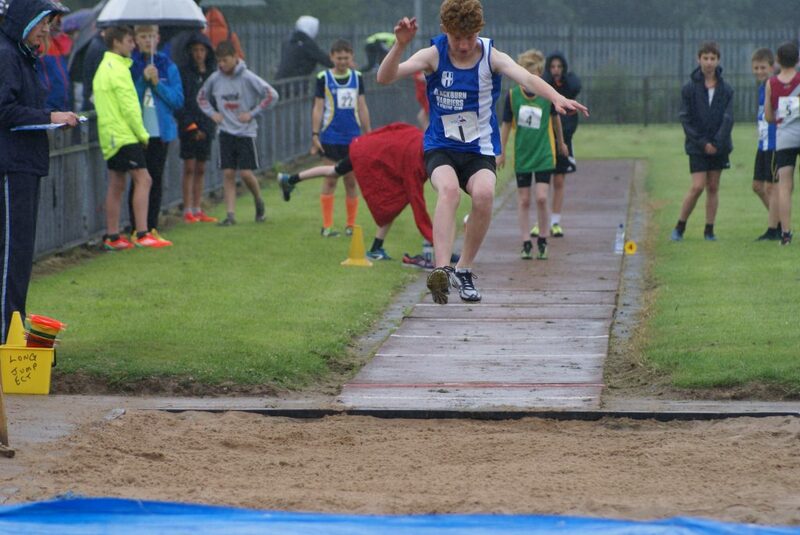 U15 Jonathan Gough had a pretty good day when he finished 2nd in the U17 Triple Jump competition with 11.31m, won the U15B Long Jump with 5.47m and took the 100m in a winning time of 12.30 which equaled his personal best. 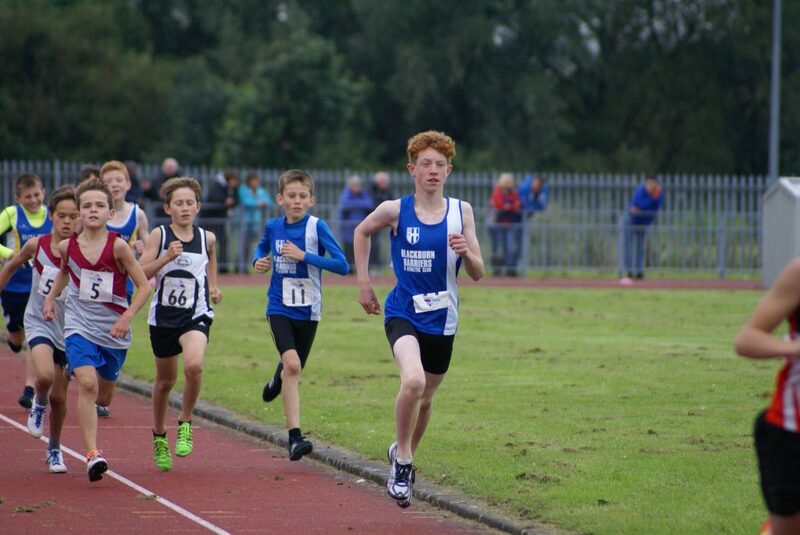 New member U15 Harvey Bradshaw also had a good day in his second outing for the Club running a time of 13.8 in the 100m (7th) and leaping to 4.41m in the Long Jump also in 7th spot. 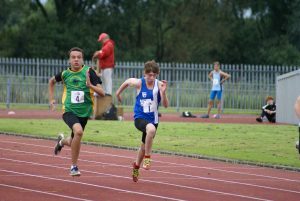 In other sprint races Paul Coffey took 4th place in the Senior Men’s 200m in a time of 24.00 – U17 Emily Warren ran 13.20 in Heat (1) of the 100m for 3rd place and placed 2nd in Heat (2) of the 200m in a time of 27.40. 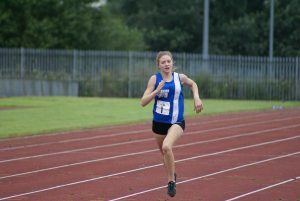 In the same Heat (2) Hannah Cookson finished 4th in 28.20. 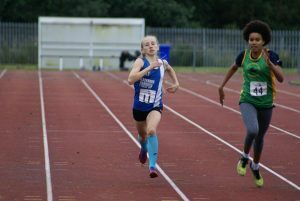 U15 Aysha Karolia ran 14.30 in Heat (2) of the 100m for 2nd position and backed that up with a 3rd place in Heat (2) of the 200m in 29.80 both of which were new PB’s for her – by a tenth in the 100m and a full second over the longer distance of 200m. 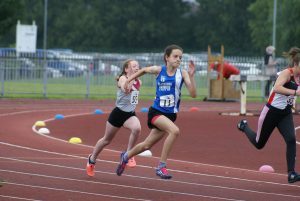 U15 Myah Booth equaled her personal best in Heat (1) 0f the 200m with a 3rd placed clocking of 28.10 before going on to take 3rd in the Javelin (22.92m) and 2nd in the Shot Putt with a throw of 10.71m which was a big new PB by over half a metre. 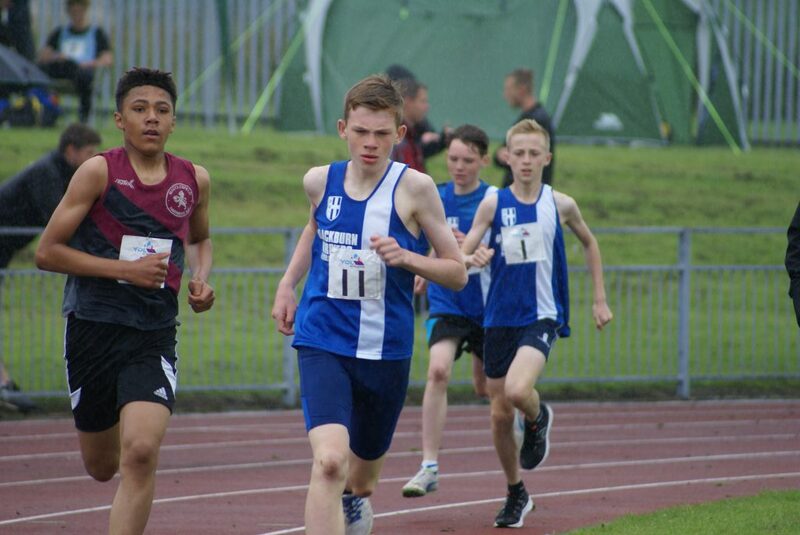 Some of the U13 Boys were also involved in the Sprints which saw David Holman take 3rd place in Heat (2) of the 100m in 14.80, Issac Butler finish 2nd in the 200m Heat (2) in 31.50 in his first attempt over the distance and Codie Dewhurst who was also running the distance for the first time placing 5th in Heat (1) of the 200m in a time of 32.90. 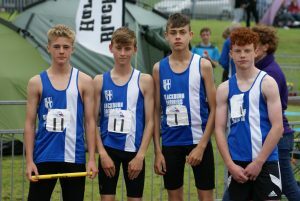 The U13 Boys entered a team in the 4 x 100m relay and came 2nd in a race of two teams in a time of 59.60 with the winners running one tenth faster in 59.50 – great effort by the lads. 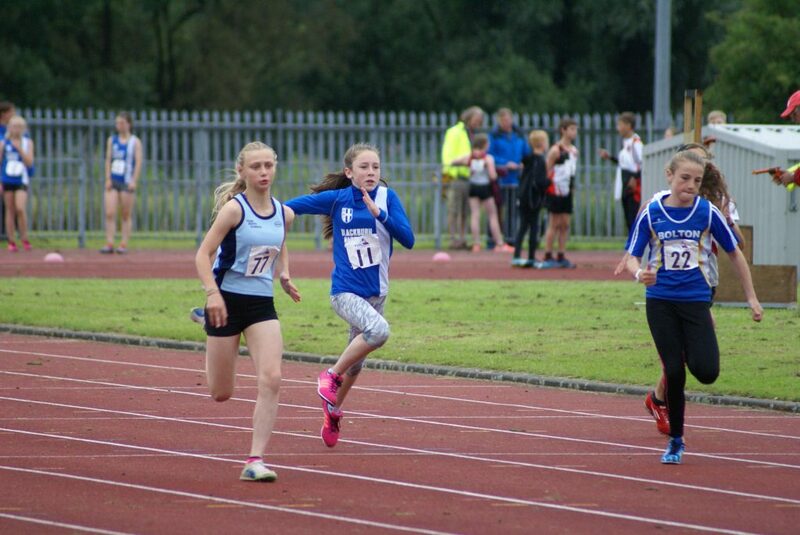 Kate Cookson ran 31.20 in Heat (1) for 4th place of the U13 Girls 200m with Keira Haxton running 33.80 in Heat (2) finishing 6th. 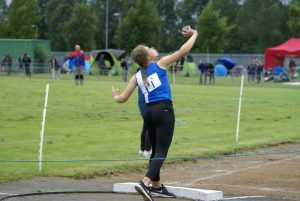 In the Throws events it was another good day for U13 Nicole Saunders winning the Shot Putt with a throw of 8.72m, the Discus with 28.32m and placing 2nd in the Javelin with a distance of 25.85m which was over a metre longer than she had thrown previously setting a new personal best. 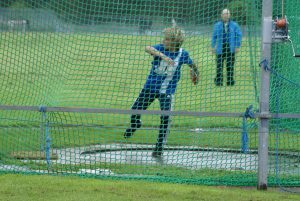 U13 Kyle Taylor-Pomfret came 2nd in the Hammer (16.09m) which was a new PB with the 4kg weight before going on to win the Discus with a throw of 17.61m. 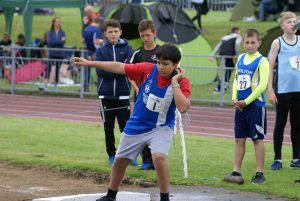 New member U15 Matthew Heywood was competing for the first time for the Club and started off pretty well with a 4th placed throw of 5.99m in the Shot Putt and another 4th place in the Discus with 21.96m. 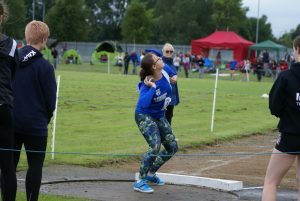 U17 Woman Emily Taberner earned two 2nd places in the Discus with 21.37m – a new PB by half a metre and in the Javelin with 28.86m which was also a new PB. 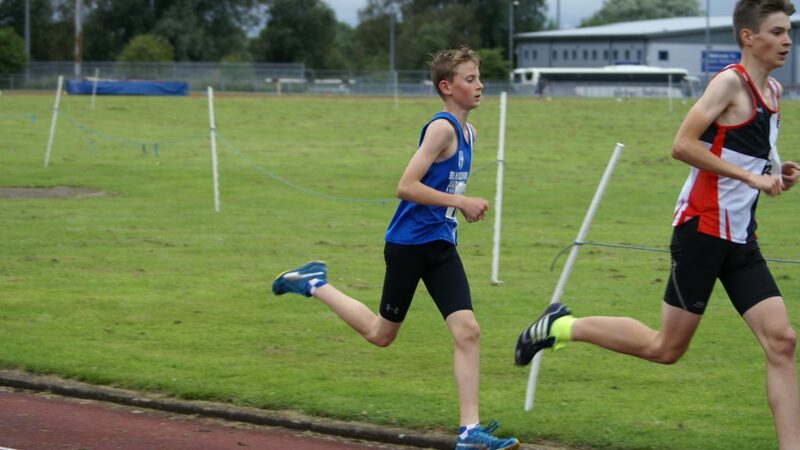 In the Middle Distance events David Holman finished 4th in the U13 Boys 800m in 2.34.9 in Heat (1) with Isaac Butler placing 6th in the same Race in 2.39.1 and Codie Dewhurst 7th in Heat (2) in a new PB time of 2.51.3, a time faster by four seconds than his previous best. 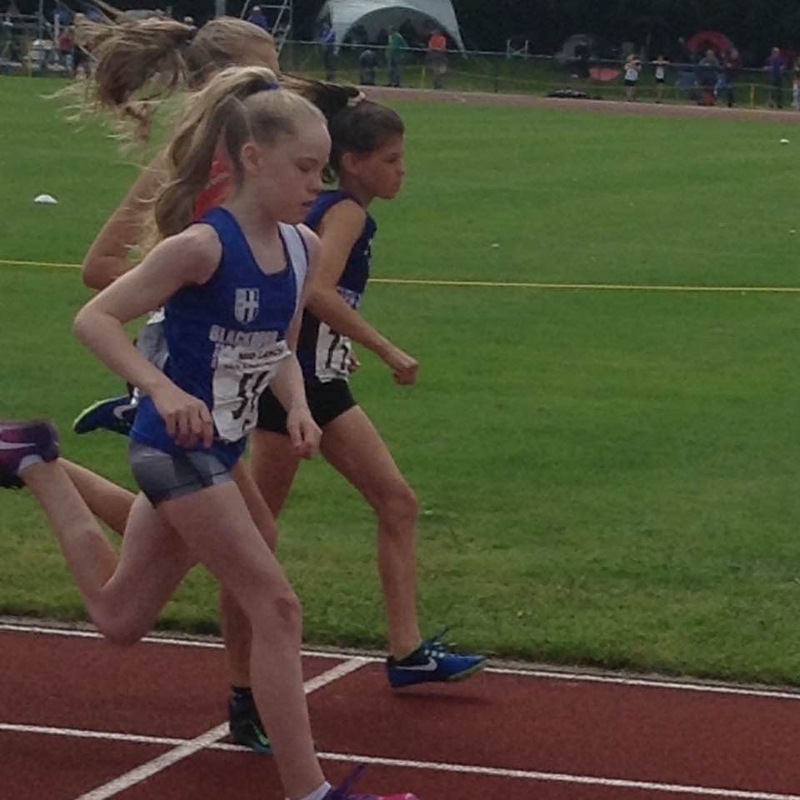 In the U13 Girls 800m Kate Cookson ran 2.45.2 – a new PB by two seconds for 6th spot in the thirteen strong field with Keira Haxton 8th in 2.49.3 also a new PB by one tenth. 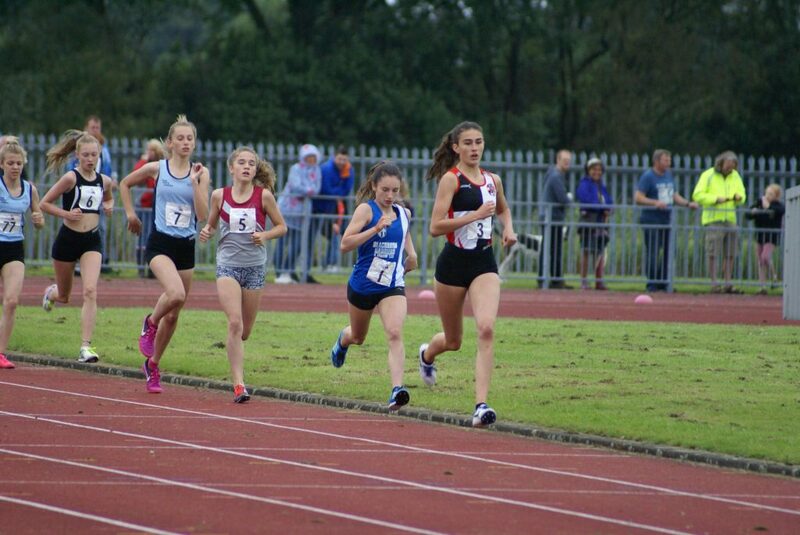 Sophie Stanworth took 3rd spot in the U15 Girls 800m in 2.29.6 and Hannah Cookson who was the only athlete in the U17 Women’s 800m ran 2.45.1 followed by a 67.2 clocking (2nd) in the 400m. 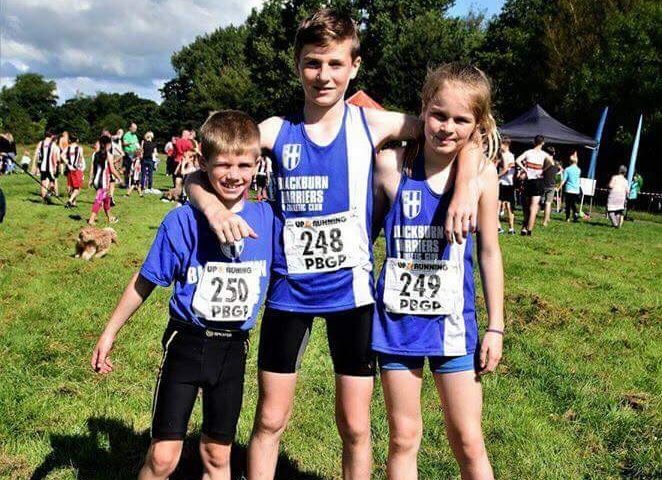 Kyle Taylor-Pomfret came in 3rd in the U13 Boys 1500m in 5.15.20 whilst Harry Wilkin came home in 3rd position in the U15 Boys 1500m in a time of 5.06.8 and Amy Davies won the U15 Girls 1500m in a time of 5.00.9. 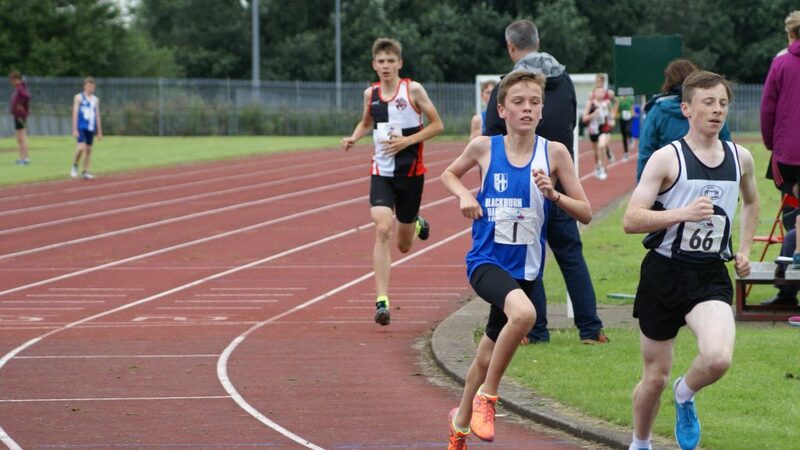 Chris Davies ran the 3000m to win it in a new PB time of 9.25.2 – a new personal best by a massive nine seconds. 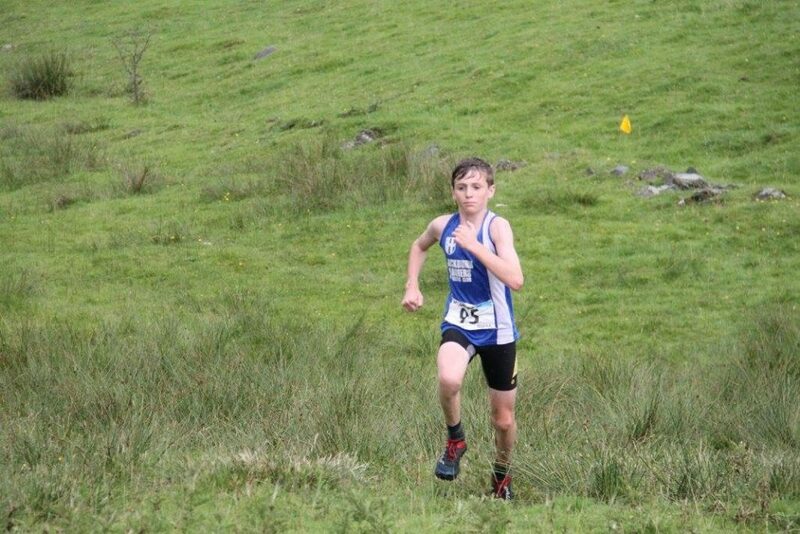 Nicholas Smith (U17) came 2nd in the race with a time of 9.54.9. 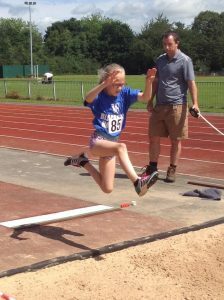 In the Jumps events U13’s Kate Cookson and Keira Haxton competed in the Long Jump which saw Kate in her first competition in the event finish 8th out of twenty two athletes with a distance of 3.59m and Keira 20th (2.61m) which was a new PB. 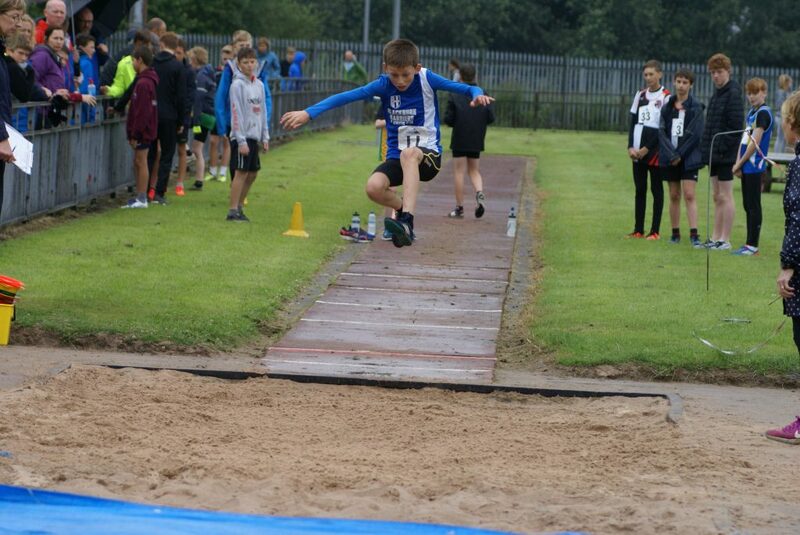 U13 Isaac Butler came 6th out of nineteen in the Long Jump with 3.83m which was a new PB for him, the same event seeing David Holman have a go for the first time and placing 15th with 3.39m and Codie Dewhurst jumping 2.81m in 19th place. 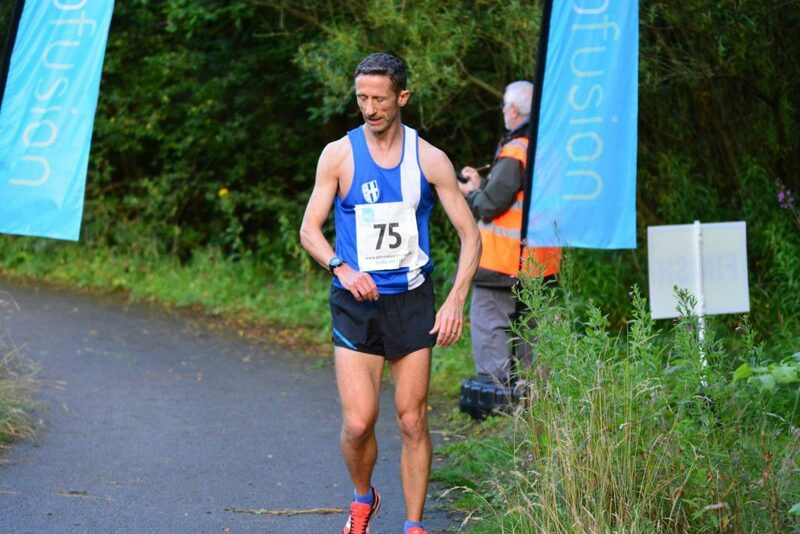 One hundred and fifteen finishers in this local 10k Race won by Rob Danson in time of 31.54. 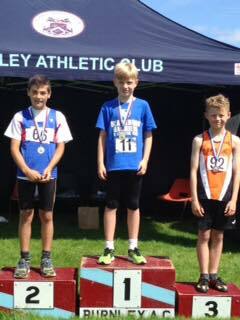 Blackburn Harrier Joe Monk came 2nd in a time of 33.47 in a race which was very windy. 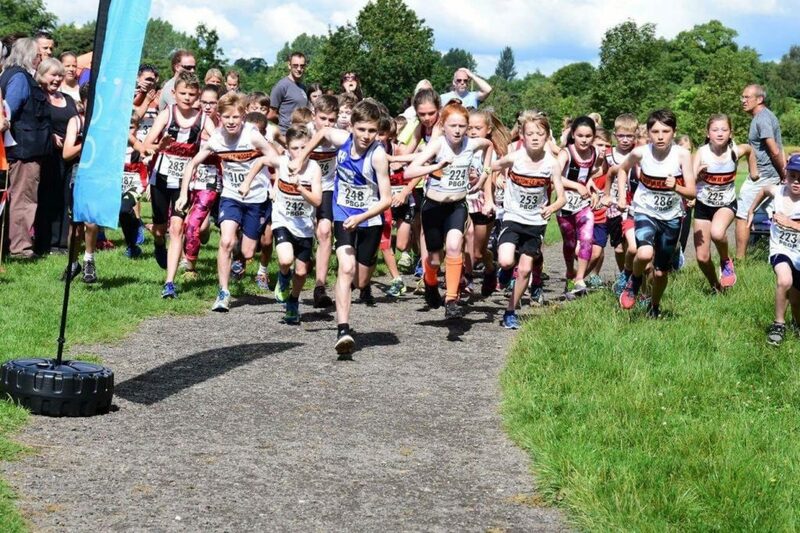 Next up for Joe is the Sale Sizzler 5k this coming Thursday. 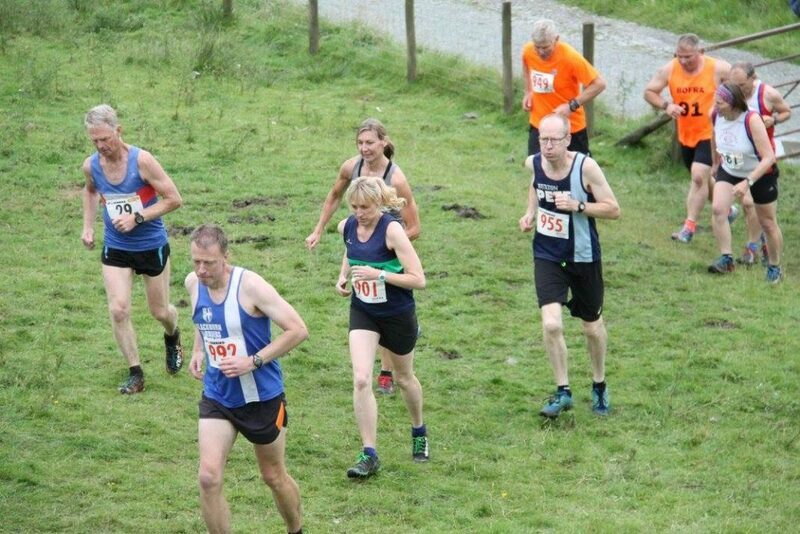 An unusually small field for Race (3) of this years years Series with just sixty nine runners entered. 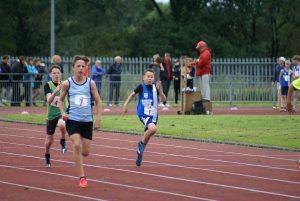 On the night it was another emphatic win by Ben Fish in a time of 25.28 which was ten seconds quicker than when he he last ran this Race in August 2015 – two years ago. 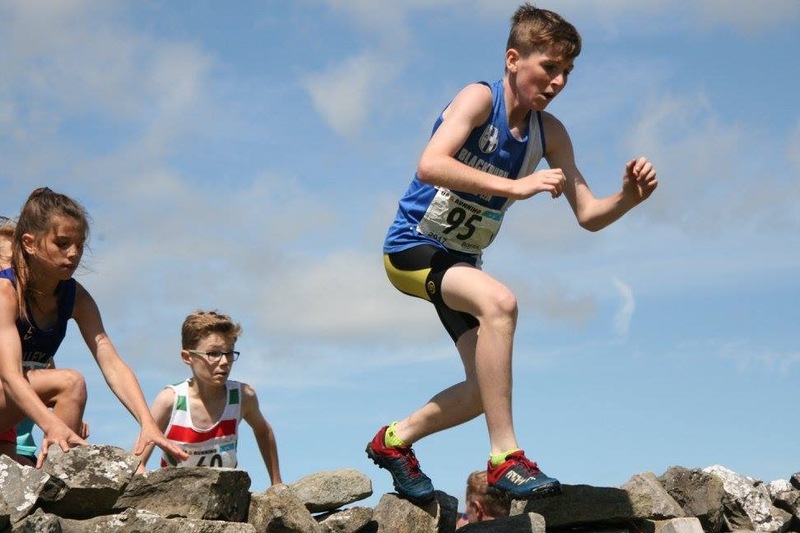 Chris Davies (V40) came second behind Ben in a time of 28.07 which was a new PB on this course and he was followed in by Ben Costello who was racing over the distance for the first time in 4th place with a time of 29.07 to give the Harriers three in the first four finishers. 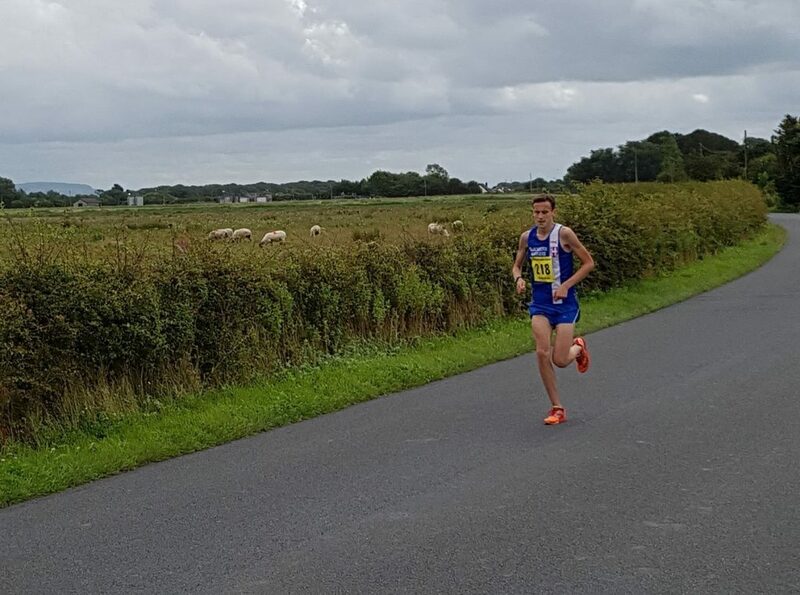 V50 David Morris finished in 69th spot with a time of 51.02. 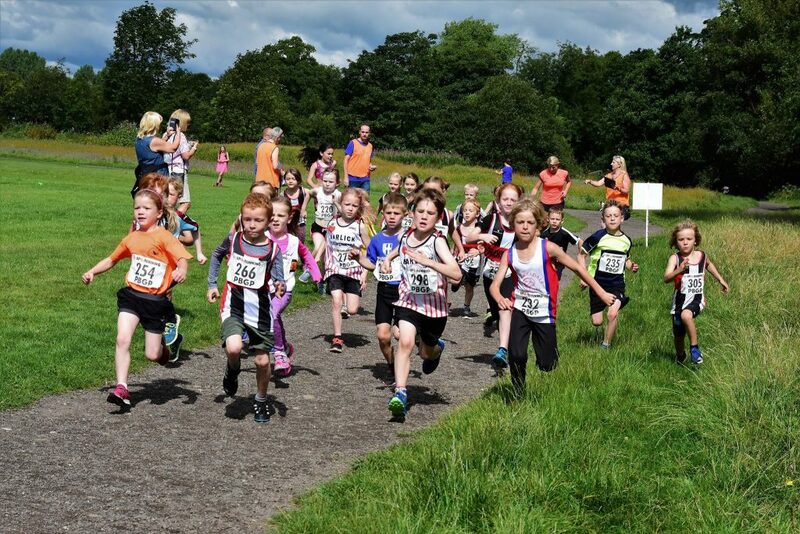 The Junior One Mile featured forty eight youngsters in the U9 & U11 and nineteen in the U13 & U15 Races. 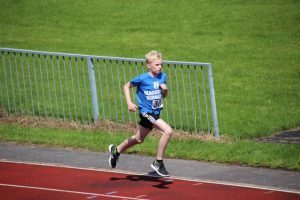 Saul Sharp was the first Harrier home in the U9/U11 Race in 5th position clocking a time of 6.07 followed by new member Harry Sambrook having a great debut in 7th place (6.15). 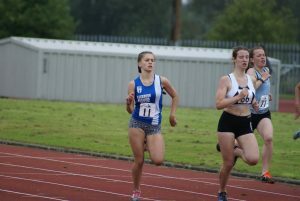 Next in came Oliver Gill in 10th place (6.23) followed by Hannah Davies (17th) in 6.45 having a battle with Isabelle Hartley in 18th (6.48). 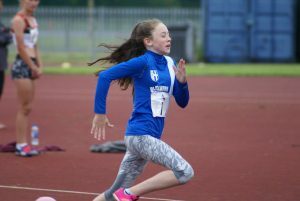 Findlay Carroll was the next youngster in (22nd) with a time of 6.52 followed by Tippi Francis (33rd) in 7.23 and Lulu Sharp (41st) with a time of 8.04. 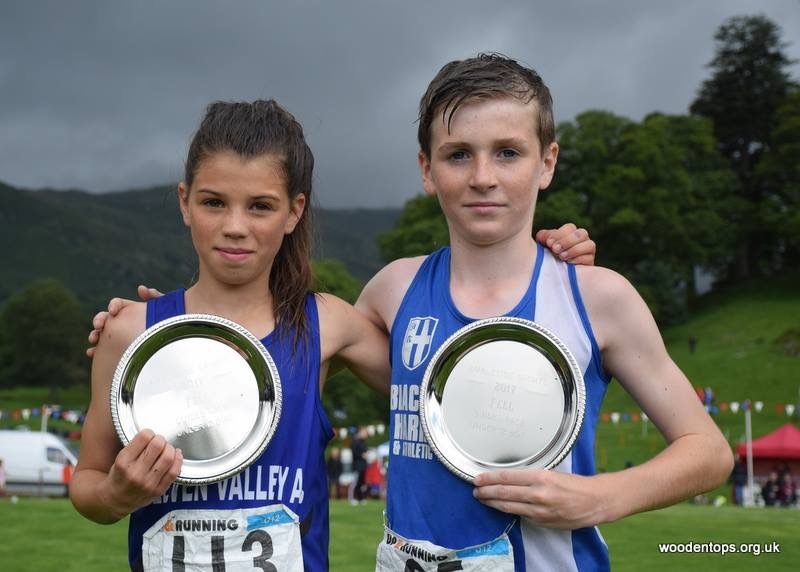 The second Race for U13 & U15 athletes saw Leon Thomas place 5th overall in a time of 5.16 and Amy Davies 8th and 1st Girl in 5.31. Shaun Livesey is going pretty well in 3rd place overall in this years Grand Prix and is also in first place in the V40 category. 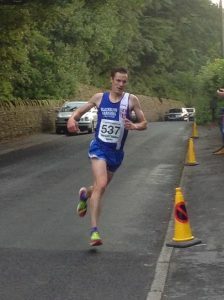 Another very good race by Shaun following his 2nd place at Hendon Brook saw him consolidate his position when he finished 3rd overall in the Towneley Park 10k on July 23rd in a time of 35.40. 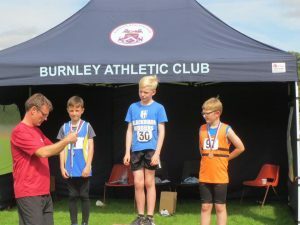 New member V40 Daniel Whittaker was also racing as was V65 Evan Cook in their first races of the Series with Daniel finishing 29th in 41.13 and Evan in 75th (45.55) and 1st V65. 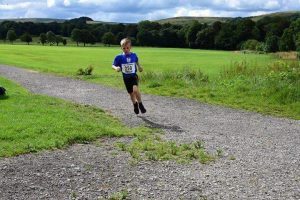 Following the Towneley Park Race Dexta Thompson now leads the Standings from Donnabhan Rudden (Keighley) with Felix Thompson currently 3rd in the U9 Boys behind Callum Singleton and Harry Jordan (Trawden) (Junior Boys Standings). 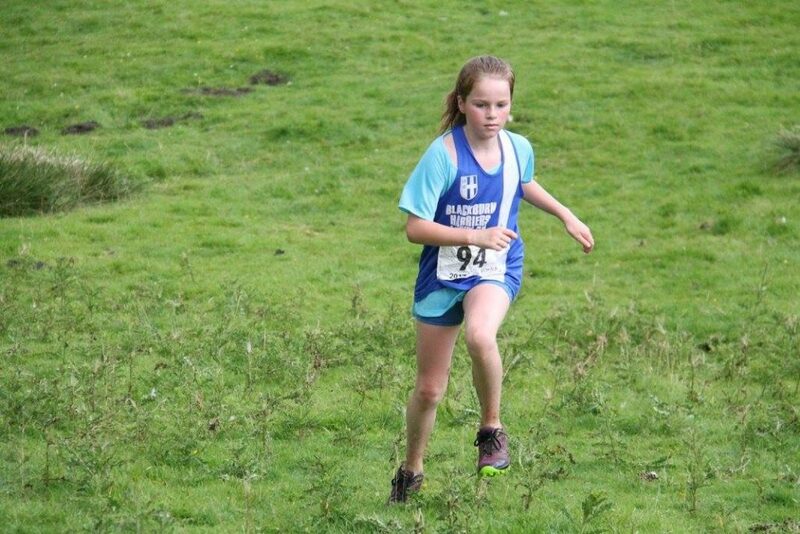 Kady Thompson currently lays in 6th place in the U11 Girls – (Junior Girls Standings) with Lucille Pickles (Barlick) currently leading. 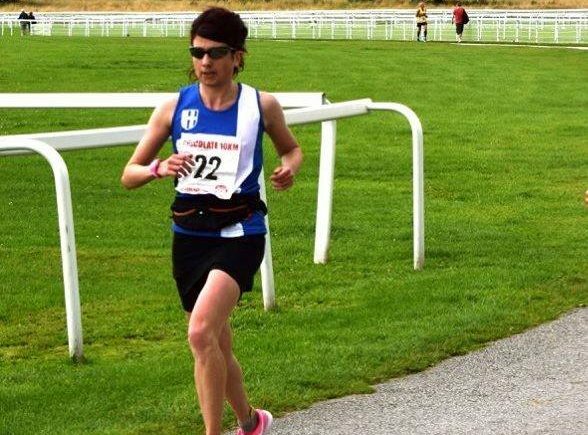 Rachel Wood is preparing for the forthcoming Berlin Marathon, her latest race in the build up was the undulating Half-Marathon at Caterham which had a field of two hundred and two runners, the Race being won by Kevin Quinn in 71.03. 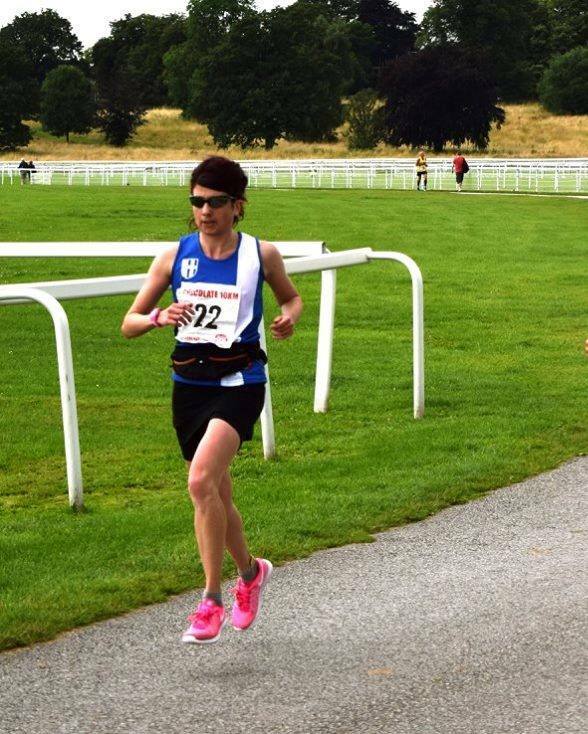 Even though she was struggling with feeling under the weather on the day Rachel still pulled out a solid run finishing in 21st place and 3rd woman with a time of 89.30. 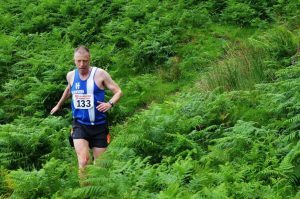 John Orrell has been getting round the country of late with a variety of Fell Races and Events making it a busy period over the last six weeks or so. 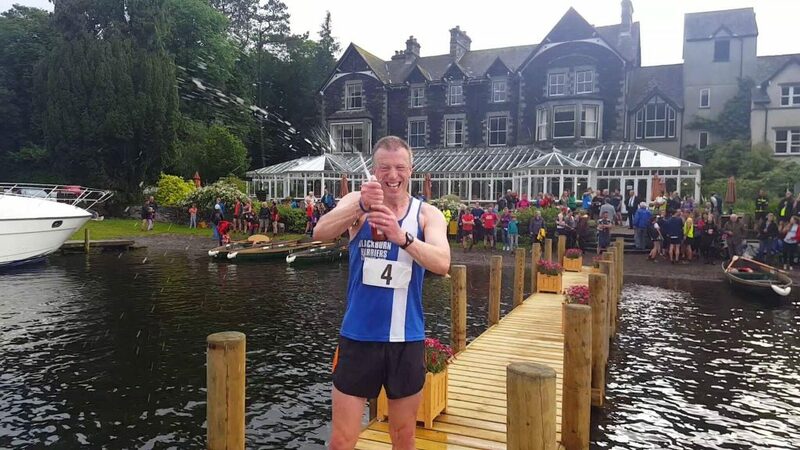 On June 10th John entered the Lakeside-Gummers How which can only field fourteen entrants in the Individual race – won by Ian Holmes in a time of 27.12 – involving rowing across a lake! 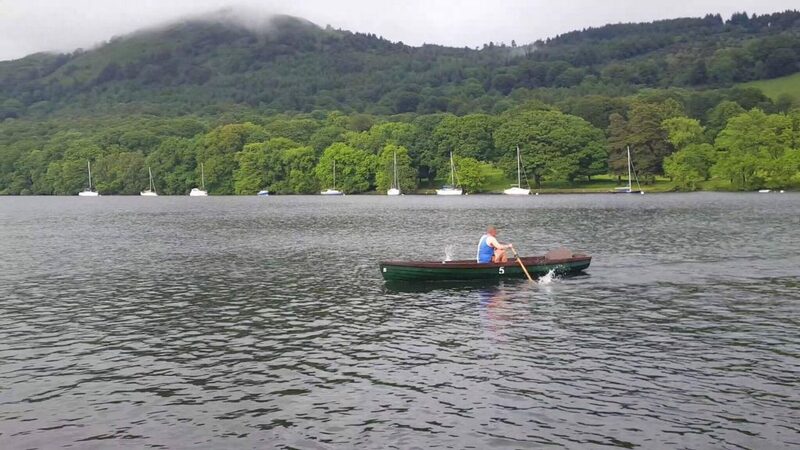 John describes the day vividly as “A crazy race which involves rowing across Windermere. 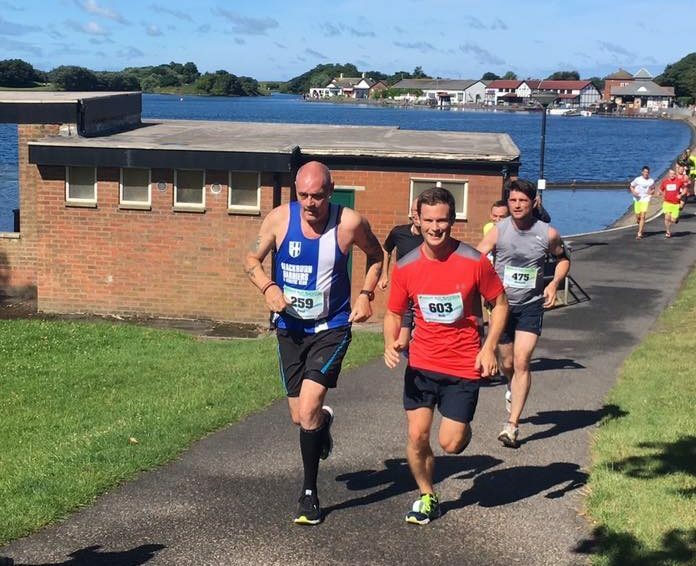 With only 14 rowing boats there is a maximum of just 14 competitors, so there is nowhere to hide, especially with the likes of Ian Holmes at the front end. It starts in a field, then 800 yards of the black stuff (give or take a couple of inches) to the front of the Lakeside Hotel. 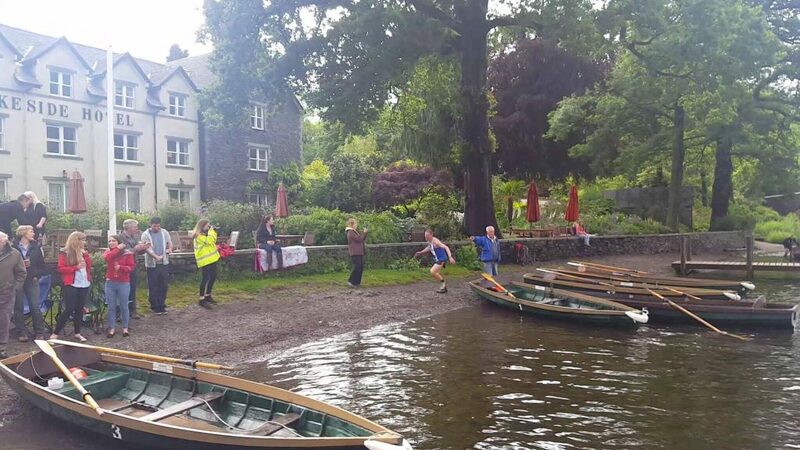 Jump in the boat, row across the lake, run up and down Gummers How and back in the boat for a final row and scramble to the finish line on the steps of the hotel lawn, where the manager hands you a bottle of beer. It was lager so I sprayed it all over the place to celebrate my 3 second PB and 11th place in 41.58”. 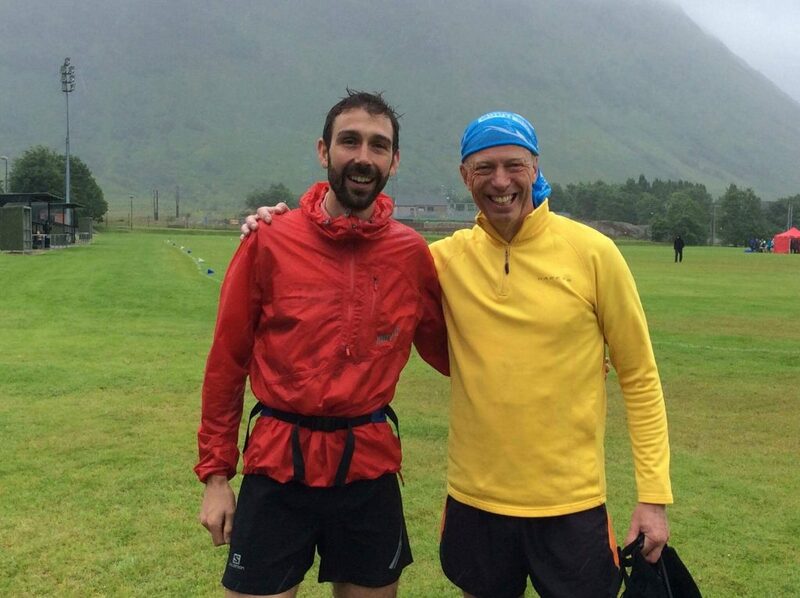 Next up for John was a trip to Scotland for The Triple Hirple organised by Lochaber AC up in Fort William consisting of three Races in three days. 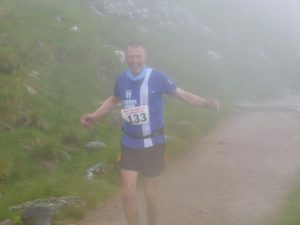 First up on 1st July, Meall an t-Suidhe featuring 3.5 miles, 1500ft ascent, straight up and down which saw John finish in 43rd spot clocking a time of 49.0. 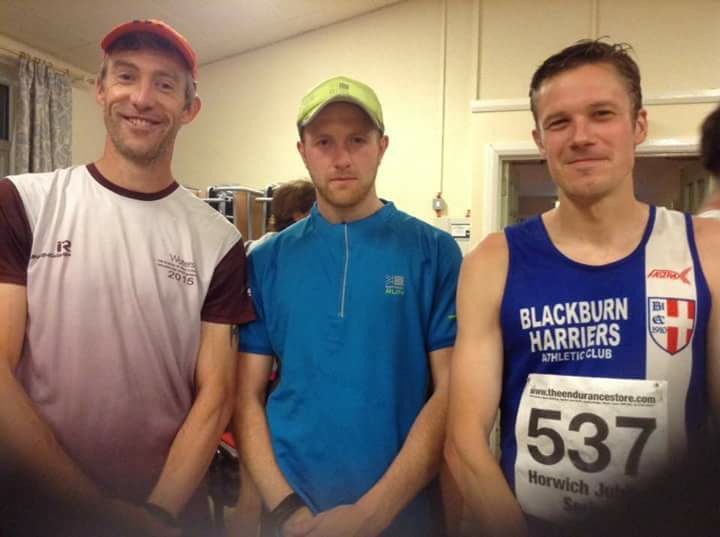 The Race was won by one of the top athletes in the Fell Racing world – Findlay Wild in a time of 28.11 and John managed to get a selfie with him after the Race quipping “Findlay Wild Scottish Hill runner meets English Hill Runner”. 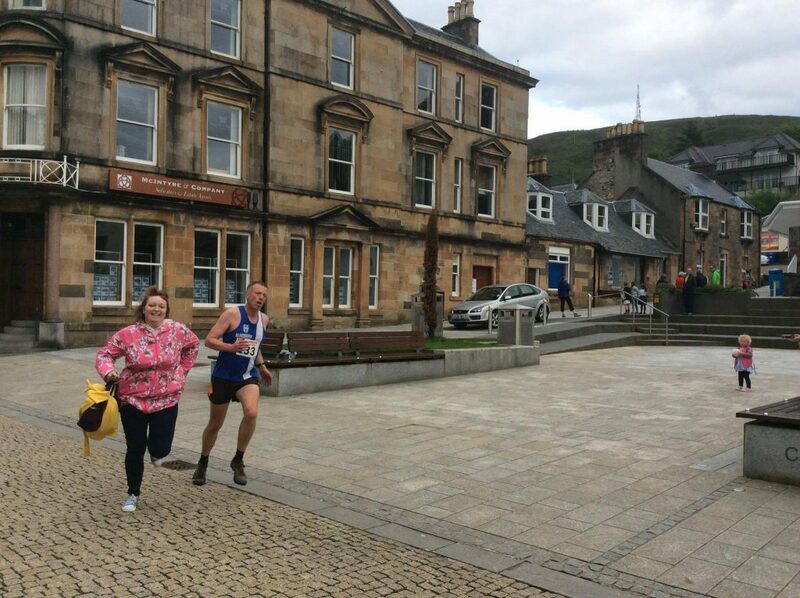 Next Race the day after on July 2nd was the Half Ben Nevis. 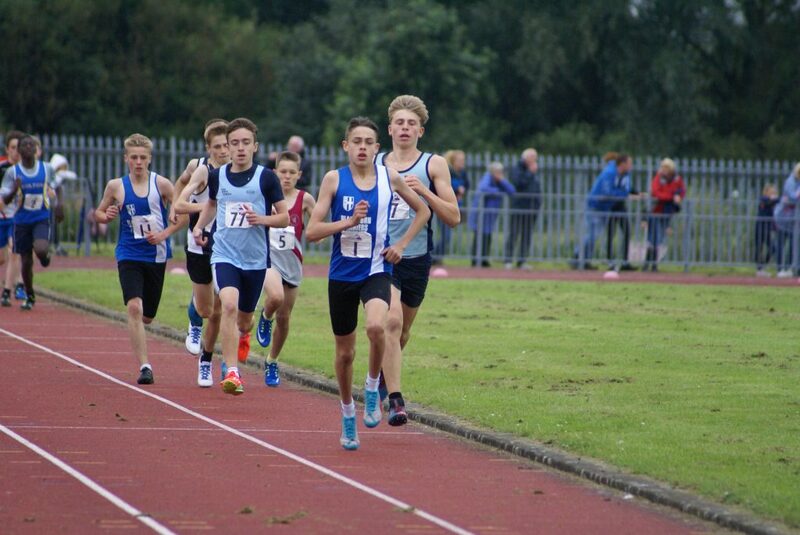 Seventy runners in this one which saw another win for Findlay Wild in 52.05. 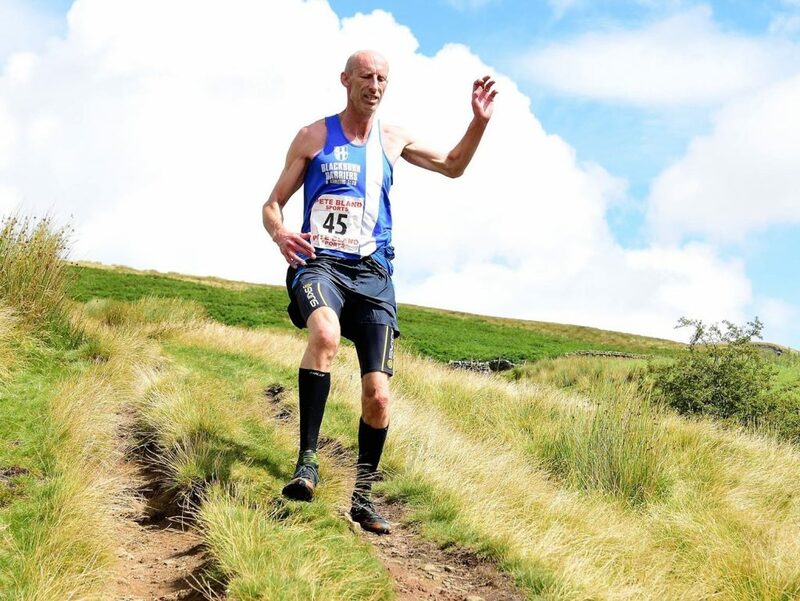 The Race consists of six miles in distance and 2200ft of climbing described by John as “up the mountain track to the Red Burn and back” as he finished in 51st with a time of 88.18. 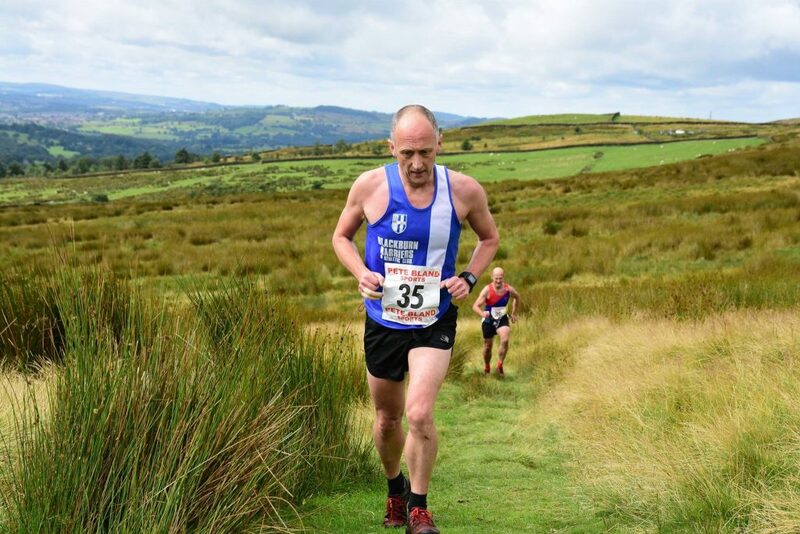 The last Race for John in this period featured him back on “home turf” on July 15th at the Ingleborough Fell Race where he came home in 63rd place out of a field of one hundred and twenty three runners in a time of 71.59 – the Race being won by Joe Baxter in 49.16. 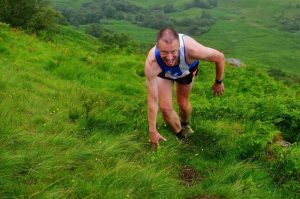 After the Race John spoke to the Club about the day telling us it was a “Quick up and down, an exhilarating mountain race. With fog down and driving drizzle, it was a real challenge to navigate ‘that best line’ off the top and stay upright. 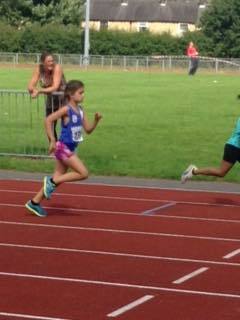 Found it and happy with 63rd in 71.59”. 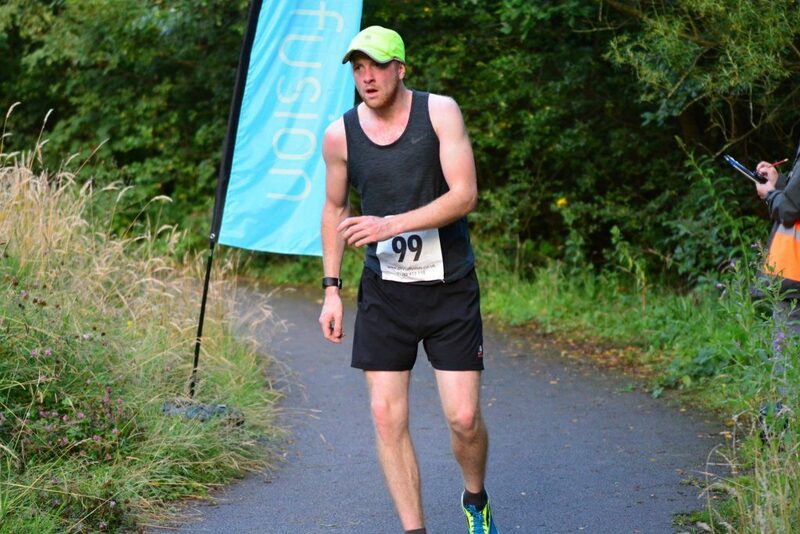 Three hundred and forty six runners completed this years race won by Joshua Jardine (Helm Hill) in a time of 1hr 32.57. 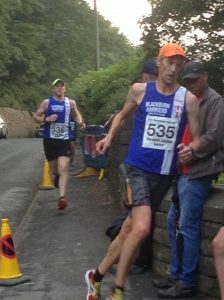 John Sutton came home in 42nd position out of a field three hundred and forty six runners clocking a time of 1hr 53.23. 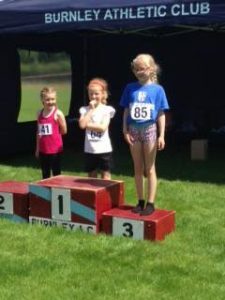 On May 6th 2007 Holly Bradshaw cleared a height of 1.90m in the Young Athletes League at Derby whilst competing for Blackburn Harriers as a bottom of age U17. 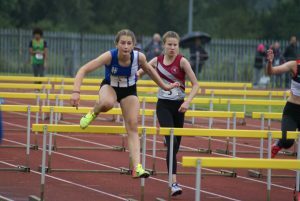 By the end of that particular Track & Field season she had improved her height to 2.30m achieved in the Northern League at Preston on July 7th 2007. 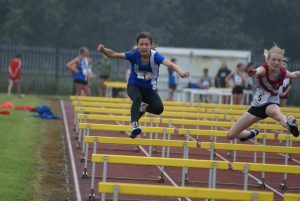 Ten years later as a Senior Athlete – last Friday – July 14th 2017 – Holly won the Pole Vault at the Stabhochsprung Meeting in Rottach-Egern, Germany with a clearance of 4.81m. In the meeting she came in at 4.45m and cleared it the second time, cleared 4.55m again the second time and then cleared 4.65m and 473m on the first jump. Moving on to 4.81 Holly cleared that at the second attempt before going for 4.90m. 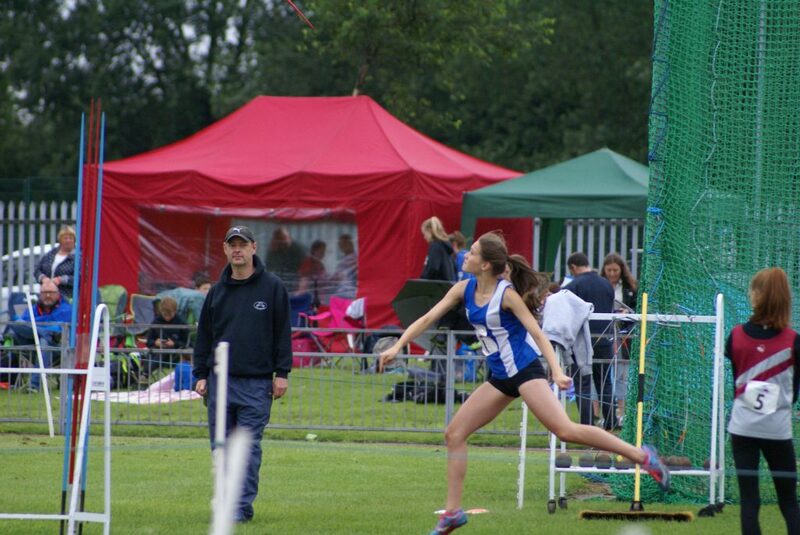 Holly has already cleared 4.80m this year too and has a life time best of 4.87m (Indoors). 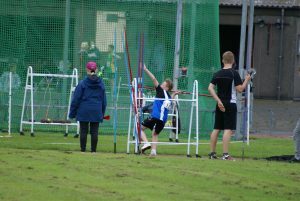 Her clearance of 4.81m in Germany broke her own Outdoor National Record. 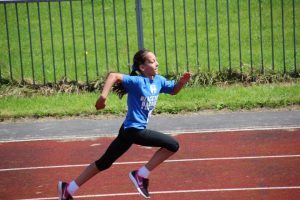 Holly is a gifted and talented athlete, but as with all athletes who achieve world class standards as she has done, a hugely important part of their success is mental strength, toughness and dogged determination in the face of all of the things that undo the hard work that has been put in. 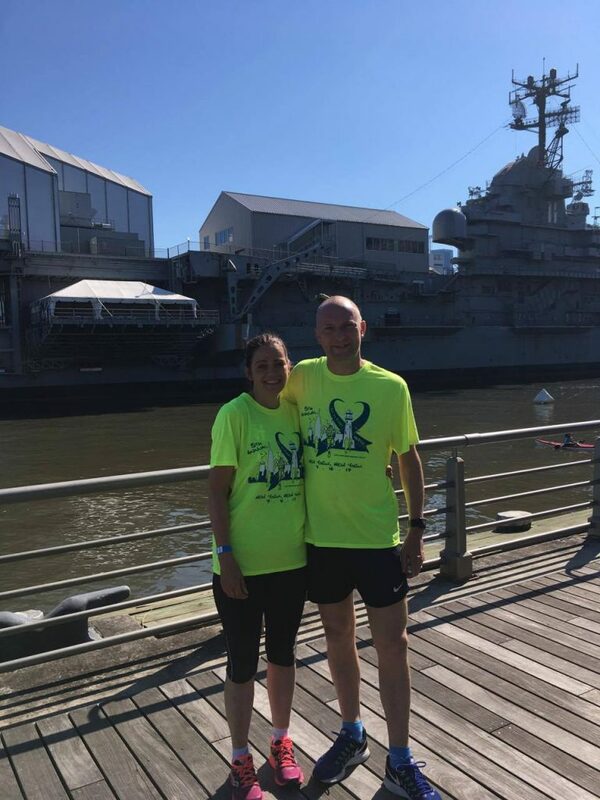 Injuries, the scourge of all athletes, are no stranger to Holly who has had to battle against the odds on more than one occasion for as he says herself “During each of the past four years, I’ve had a surgery. I’ved faced some horrible injuries. It has been relentless.Yet at no stage have i ever doubted myself”. 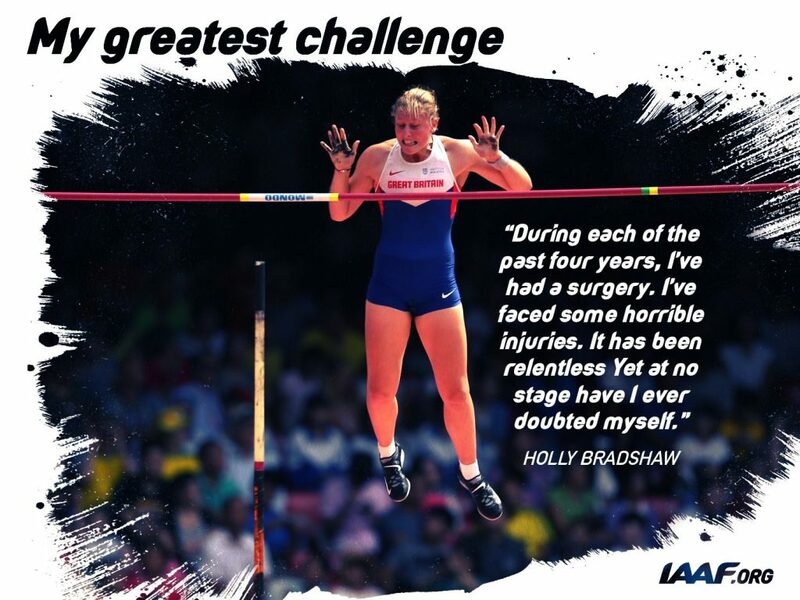 This is why Holly is a world class athlete, why she has appeared in two Olympic Finals and is now going into the forthcoming World Championships fighting for the Medals. She serves as an inspiration to all athletes and proves that with mental tenacity and the right support, injuries, serious injuries can be overcome and the march to world world class performances gets interrupted – not halted. She serves also as an inspiration to youngsters throughout the sport. 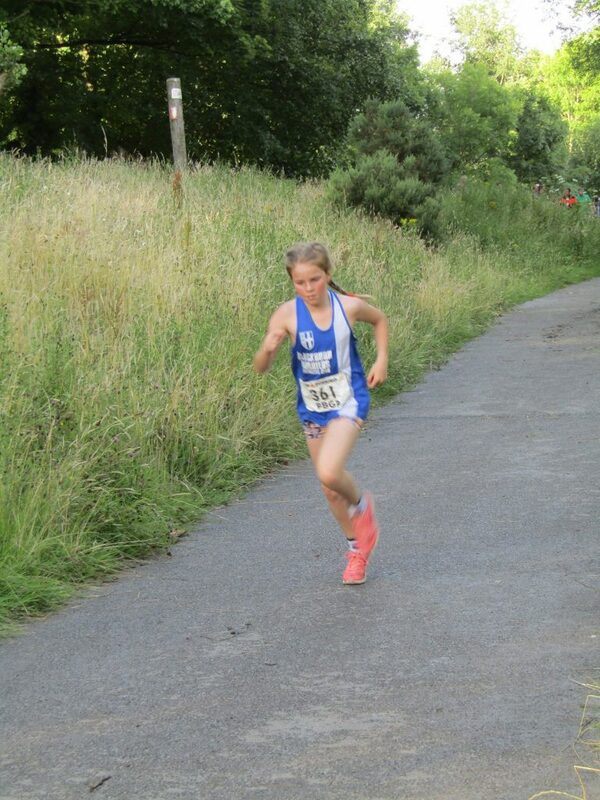 Holly’s journey, set backs and all proves that you can achieve, you can excel and be the very best. Brian Fogarty has had a brilliant year in the Ironman. 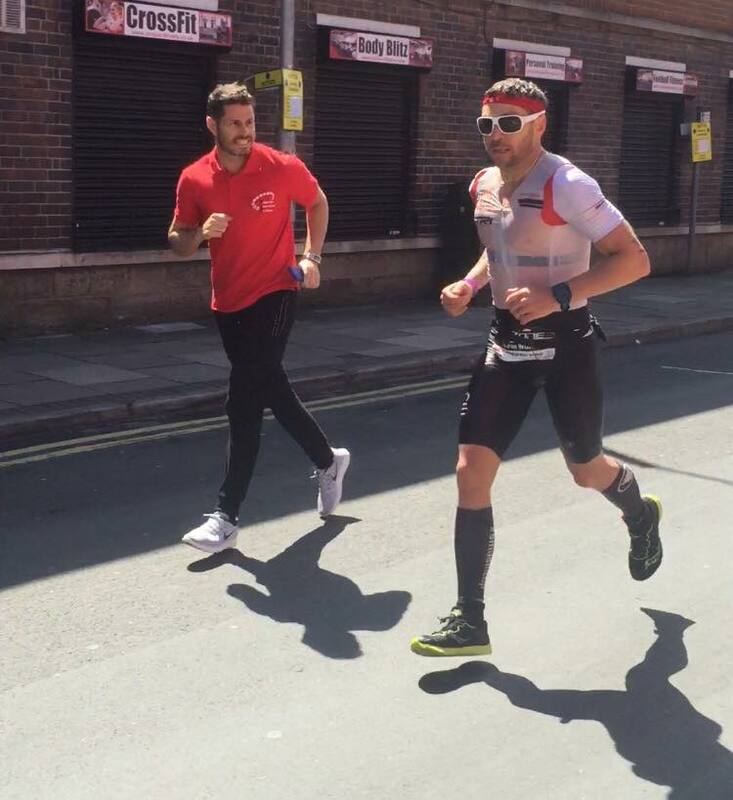 Earlier in the year he put in a superb performance at the Lanzarote Ironman finishing 11th overall – 1st British athlete & 1st Amateur in a combined time of 9hrs.22.57. Brian’s splits were 61.47 for the Swim ⇒ 4hrs 58.03 for the Bike ⇒ 3.15.18 for the Marathon. 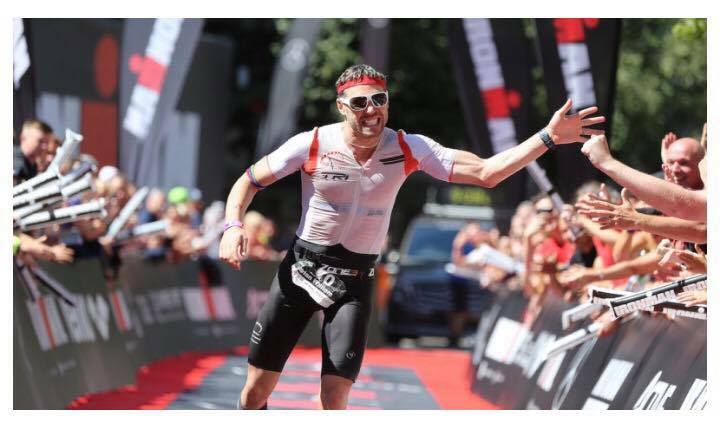 In the Ironman UK at the weekend – (July 16th) – Brian performed even better with splits of 61.47 on the Swim ⇒ 4hr.50.43 on the Bike ⇒ 3hr 03.36 for the Marathon for a total time of 9hrs 02.54. This performance, his best ever, took him to 4th spot overall, 1st Amateur with other professionals behind him. 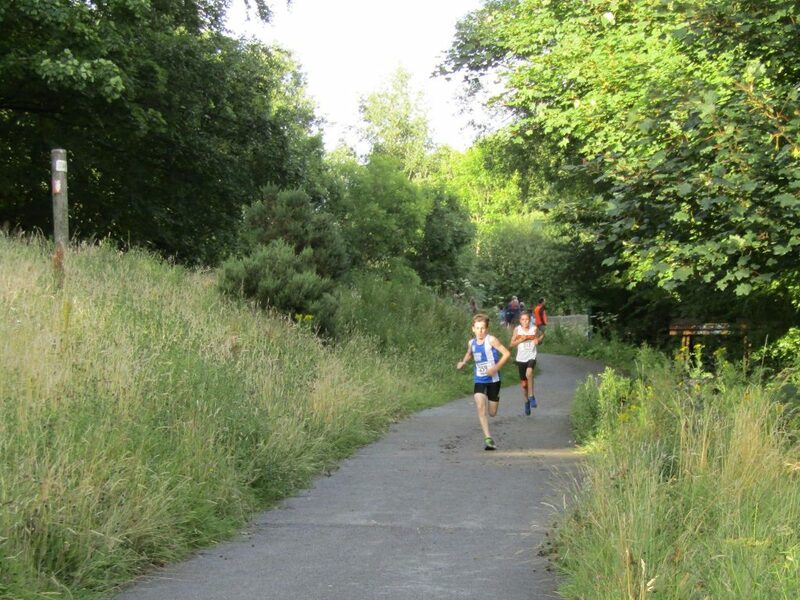 Not only that – his Bike ride was the fastest of the whole race beating all the professionals who competed on the day. 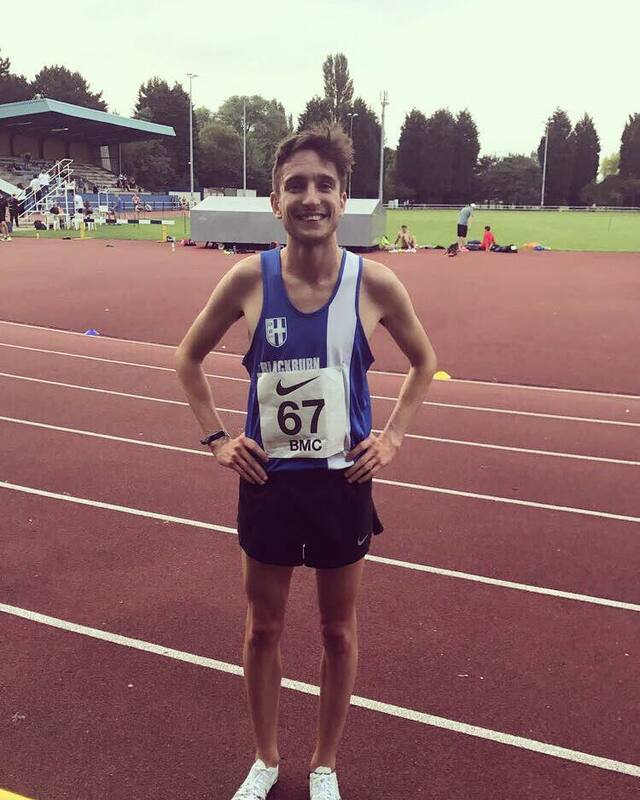 After the Race, Brian spoke to the Club telling us that he “really felt yesterday was like the result of 2 years of hard work coming to fruition. It was a performance I believed I was capable of, but that’s one thing, executing it is another. Yesterday things came together and I had my best performance to date. Time to rest up for a few days then back at it for Kona in October”. 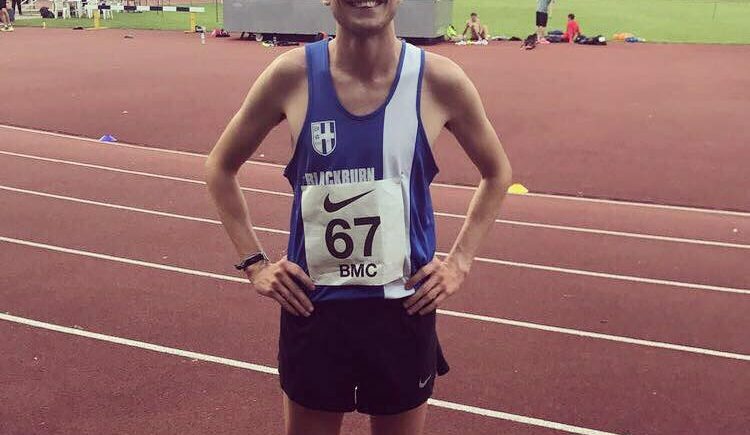 After running a new personal best – (3.51.34) – at Loughborough in the 1500m (July 8th) Rob Warner was back racing four days later at the Watford BMC meeting and again over 1500m. 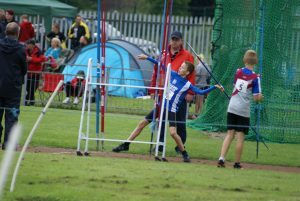 This time Rob set another new personal best of 3.51.25 placing 7th overall giving him back to back PB’s over the four day period. A happy Rob Warner spoke to the Club after the Watford meeting“I’ve been happy with both races really! 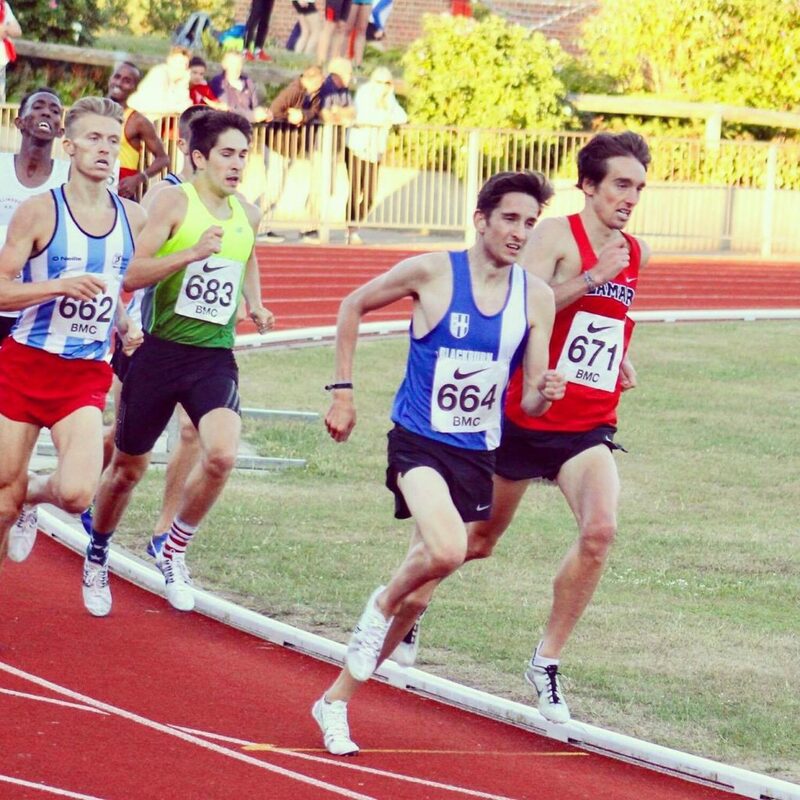 The 1500 at Watford was bit of a different race for me, I knew it was aiming to go through 800 at around 2:00/:01 so I hung back by a couple of couple of seconds and what to work my way through. 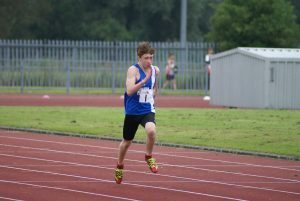 I perhaps went off a little too conservatively though as I went through 800 in 2:03/04 and was nearly last! 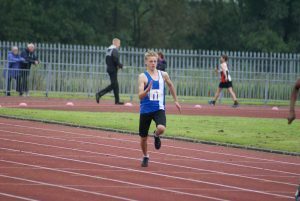 I had a really strong last 300m of about 44 seconds which is really promising but did leave me a little frustrated at myself for not going off a bit harder as I appeared to have more left in the last lap than I thought I would. Got a couple more 1500s lined up though so hoping to sneak under 3:50 before the end of the season”. 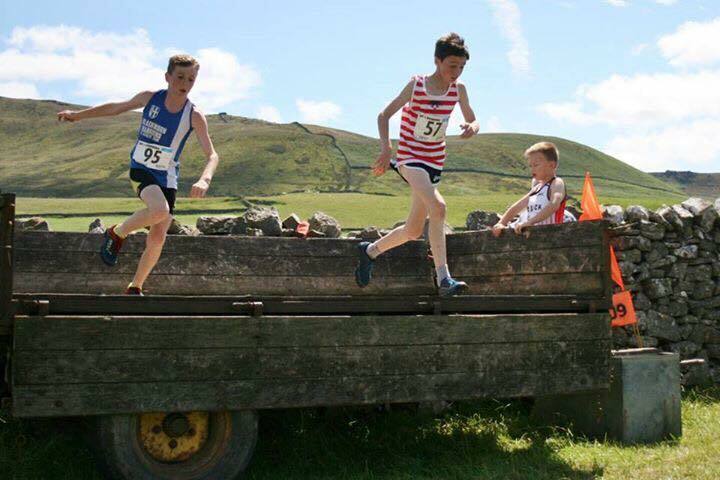 Dexta Thompson was out in the penultimate Race in this years Bofra Championships in the U12 category which has seen him go head to head with William Hall from Calder Valley who has usually managed just to get the better of him. 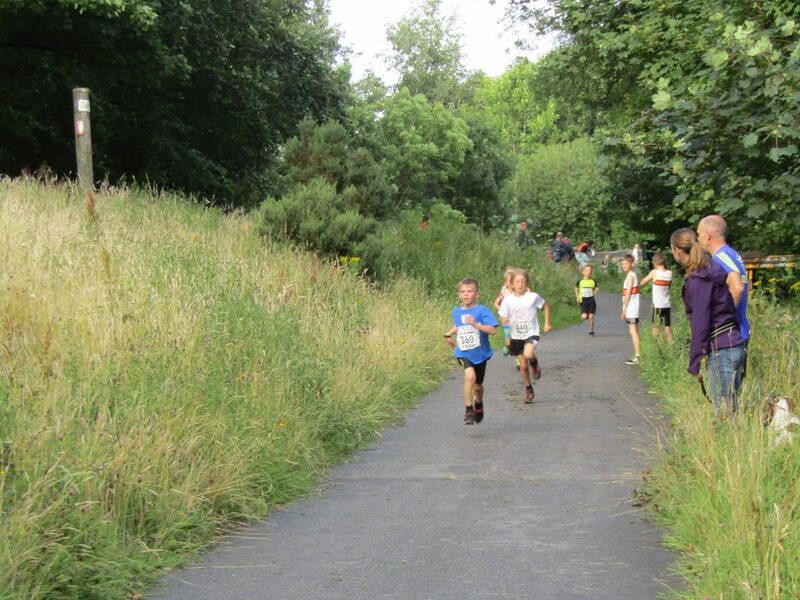 At this Race however Dexta finally managed to beat William. 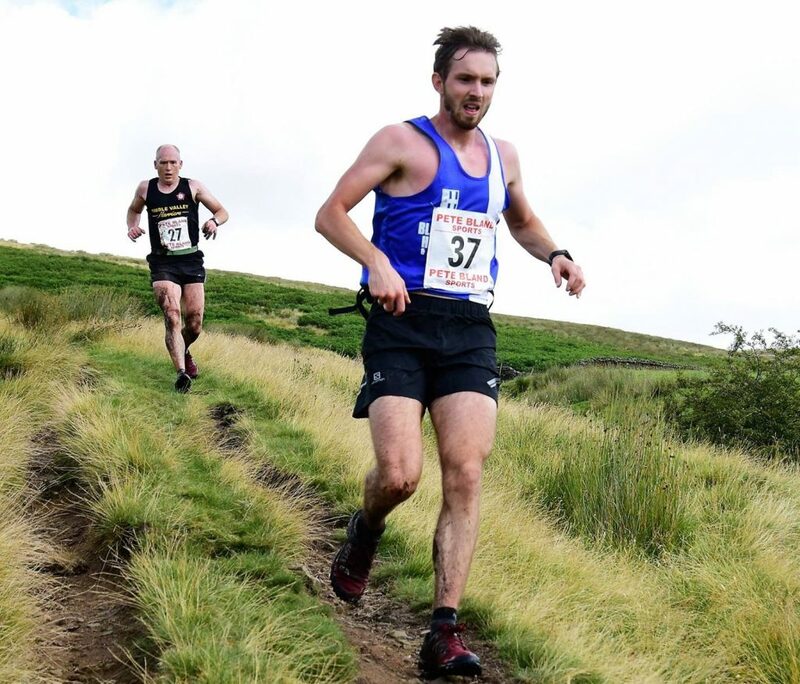 Having raced each other so many times the thought was that the Cracoe course was more suited to Dexta with the hill climb not being as steep as most of the Bofra races which is where William is really strong. 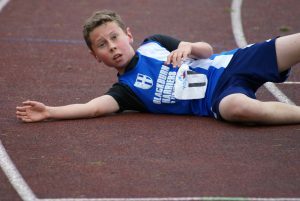 In the end Dexta won the Race in a time of 8.07 with William Hall in 2nd spot (8.10). 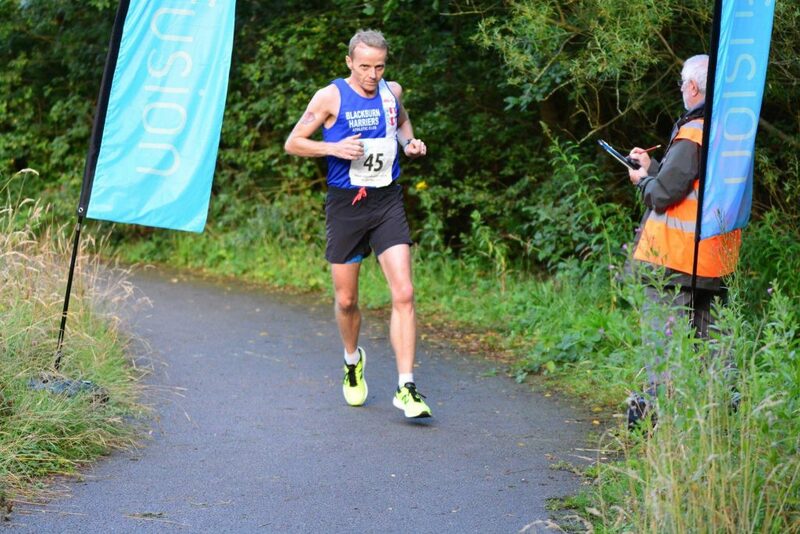 Six hundred and eighty six finishers in the this years Windmill Half won by Mike Toft in a time of 77.28. 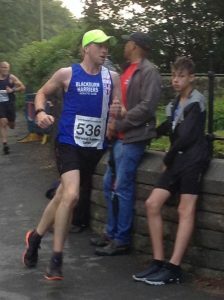 Blackburn Harrier Paul Clarke (V55) placed 154th in a time of 1hr 46.27. 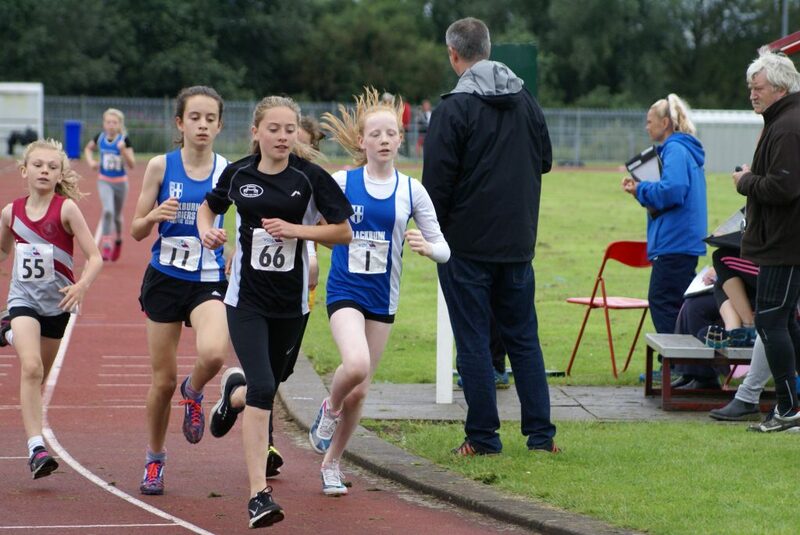 It’s been a great year for the Harriers Lower Age Group Team covering U13 and U15 Boys and Girls. 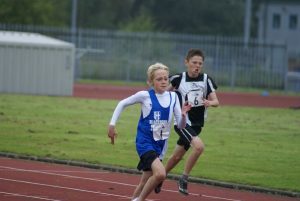 Some of the athletes involved were experienced in competitive athletics whilst others were new and competing in their first season – some great individual contributions and performances were spread across the season as the Team came 2nd in the first fixture, going on to win Fixtures Two, Three and Four – However, the greatest compliment goes to the team spirit and mentality manifested at each fixture with athletes taking on board the need to see themselves as a Team, pushing their limits and their comfort zones. 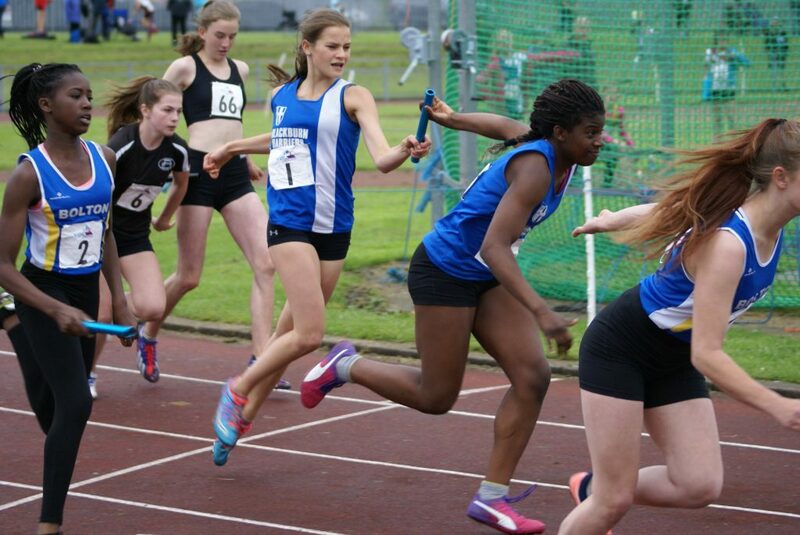 Team spirit is everything and turns good individual athletes into an even better Team and the Team really did finish the season in style recording 21 Individual wins, 20 second places, 19 new Personal Bests and right at the end of the day, the U15 Girls 4 x 100m Relay Team of – Millie Coy / Queen Tanimowo / Myah Booth / Bailey Madden – smashed the Club record of 53.6 set in May 1986 with a new time of 52.1. The Club’s Team Managers reflected on the season and shared their thoughts after the Club were confirmed as Champions with Promotion to Division One. 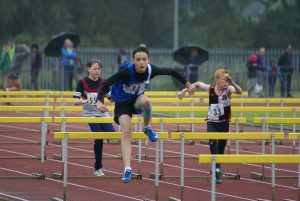 Danny Teare Boys Team Manager commented “A typical Manchester drizzly day did not dampen the desire of the Harriers YDL team to go out there and get the job done. 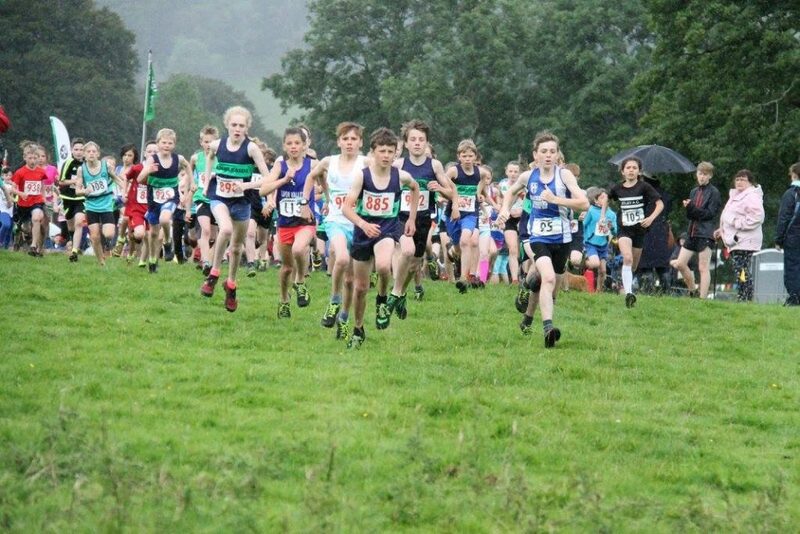 As at the 1st 3 fixtures, every member of the boys team was focused on their events and giving it their all. 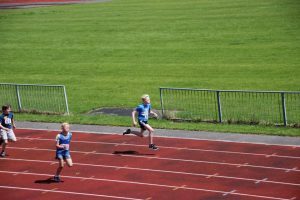 The lead on the day changed hands a couple of times but once all the results were in, it was a narrow team win, making that 3 out of 4 fixture victories in the league. 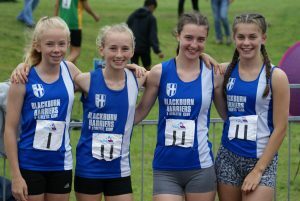 As you would expect towards the end of the athletics season, a few injuries had crept in for some athletes necessitating a couple of last minute changes on the day. We were in the fortunate position to be able to fill those gaps at short notice and maintain the momentum. 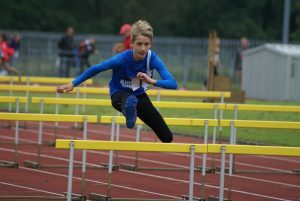 We wish those athletes who had to withdraw a speedy recovery and return to form. Contrary to previous years, we have been in the fortunate position of having high athlete availability at most fixtures. 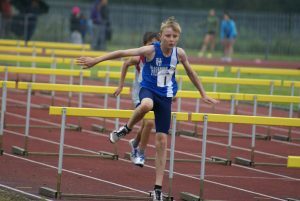 This has meant that it has not been possible to accommodate all athletes in all fixtures. 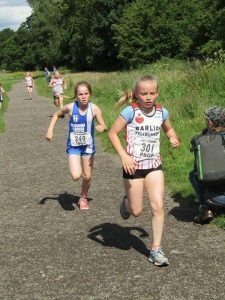 As I have previously said, as the top of age group athletes move on next season, there will be more opportunity for others. I’d like to convey my thanks to the parents who manage those messages to their children. 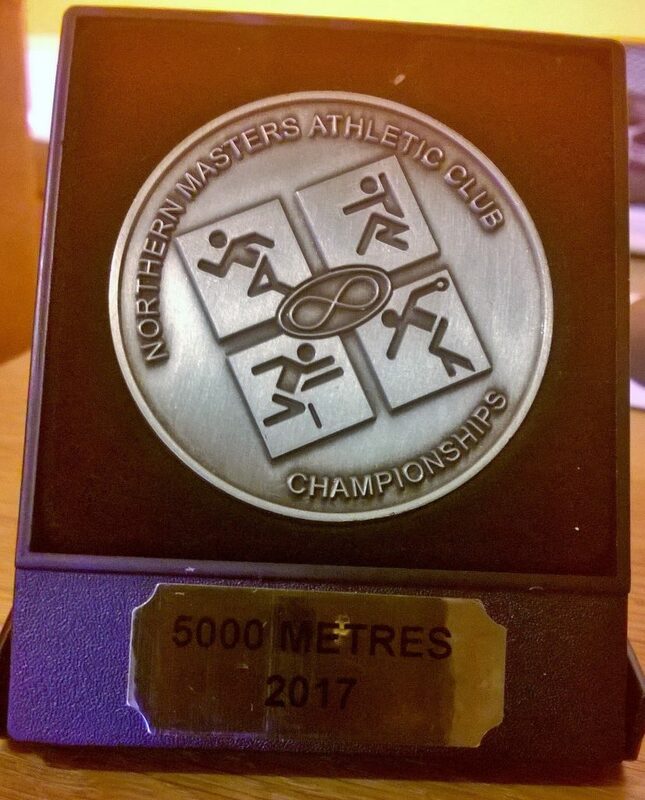 So finally, that is promotion achieved and next year we will have the challenge of competing against a largely new set of clubs. 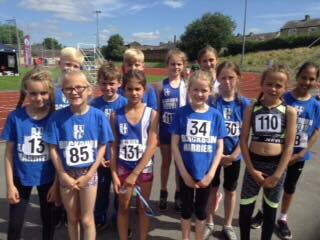 My thanks to the athletes for all their efforts this season and to the parents for providing their logistical and emotional support. 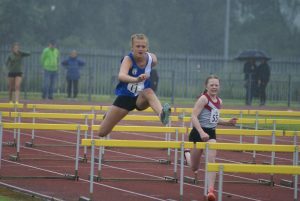 On a grey and drizzling morning the Hurdles were first up, again producing wins and good points for the Harriers as they have throughout all four fixtures. 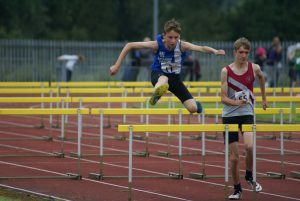 U15’s Harry Jackson and Jamie Teare teamed up in the 80m Hurdles with Harry setting a new PB – 5th in the ‘A’ (15.1) and Jamie 2nd in the ‘B’ with 16.2 – in the U15 Girls 75m Hurdles Myah Booth won the ‘A’ in 12.1 while Queen Tanimowo won the ‘B’ in a time of 12.9 – there was another double win in the U13 Boys 75m Hurdles which saw Rory Teare win the ‘A’ in 13.9 and Ben Boocock winning the ‘B’ in a new PB time of 13.4 – in the U13 Girls 70m Hurdles Emma Love came 3rd in the ‘A’ in a time of 13.2 with Shannon Paige 2nd in the ‘B’ and posting a time of 12.9. 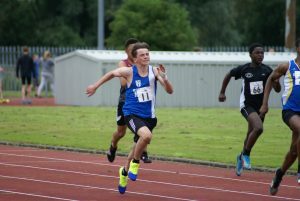 Kyle Mashiter was hindered with a hamstring pull in the U15 Boys ‘A’ 100m and finished 5th in 13.0 with Jonathan Gough 2nd in the ‘B” in a time of 12.3, a new PB by two tenths – Amy Wiggans also ran a new PB by two tenths finishing 6th in the U15 Girls ‘A’ 100m in 14.1 with Abigail Armas winning the ‘B’ in 14.0, a new PB by a tenth – Shannon Paige ran the U13 75m ‘A’ race in 10.9 (4th) and backed up by Holly Bell in the ‘B’ (5th) in a time of 11.8 – distance runner David Holman took on the U13 Boys 100m ‘A’ and came 5th in 14.7 whilst Joel Booth had a very good race to place 4th in the ‘B’ in a time of 14.3. 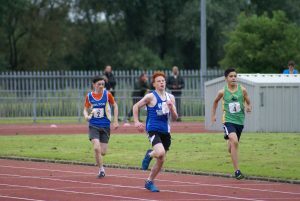 Kyle Mashiter ran a time of 25.4 in the U15 ‘A’ 200m for 3rd spot with Sam Hodkinson in 4th (26.5) in the ‘B’ Race whilst the U15 Girls powered to a double win in their 200m – Millie Coy winning the ‘A’ in new PB time of 27.5 which was half a second quicker than her previous best and Caiden Hesketh taking the ‘B’ in a time of 28.5 which was also a new PB by a tenth – Joel Booth ran a new PB time 29.3 by two tenths in the U13 Boys 200m ‘A’ in equal 3rd place whilst Joseph Joyce placed 5th in the ‘B’ in a new PB of 30.9 – Holly Bell placed 7th in the ‘A’ U13 Girls 150m (23.9) with Kate Cookson 5th in the ‘B’ Race in a time of 22.9. 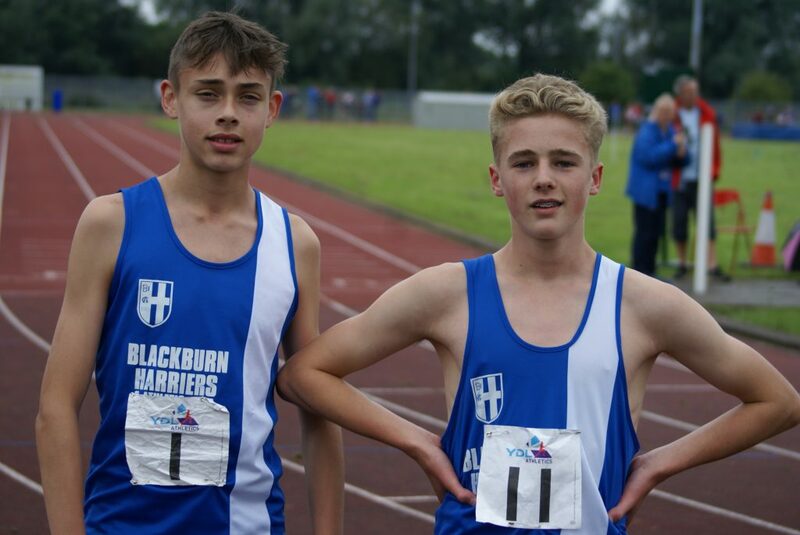 U15 Ethan Joyce ran a first class race in the 300m ‘A’ setting a new PB of 41.9 in 2nd spot whilst Harvey Ashworth ran the ‘B’ in 45.5 which was a good run after a bad start. 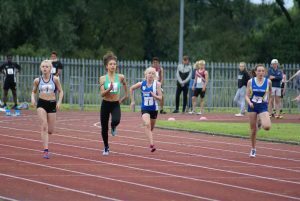 Bailey Madden was the ‘A’ runner in the U15 Girls 300m coming home 3rd in 45.1 with Eleesha Charnley 5th in the ‘B’ (46.8). 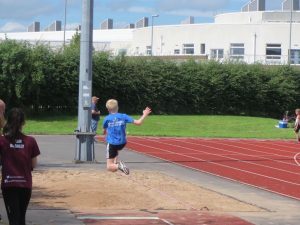 In the Jumps Events the U15 Boys got the Team off to a very good start with Jonathan Gough winning the ‘A’ Long Jump (5.37m) and George Whittaker setting a new PB of 4.50m in the ‘B’ to place 2nd. 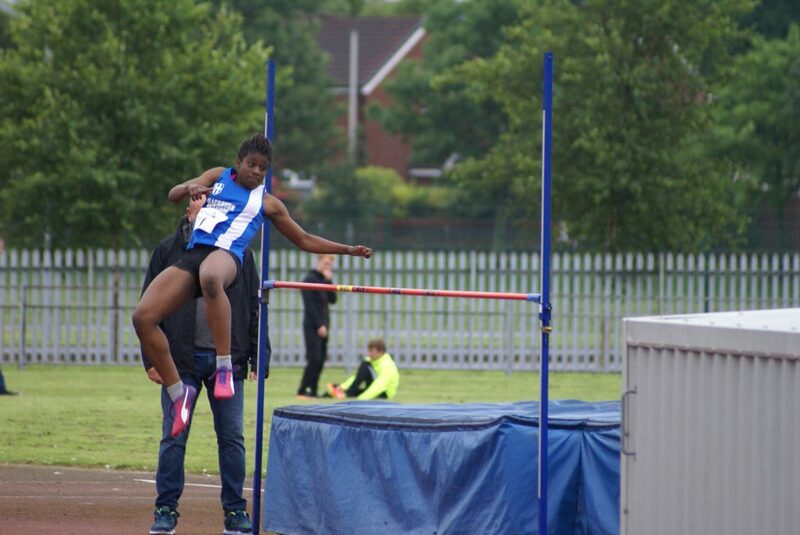 Jamie Teare came 4th in the ‘A’ U15 High Jump with a clearance of 1.45m with Jonathan Gough 3rd in the ‘B’ (1.40m). 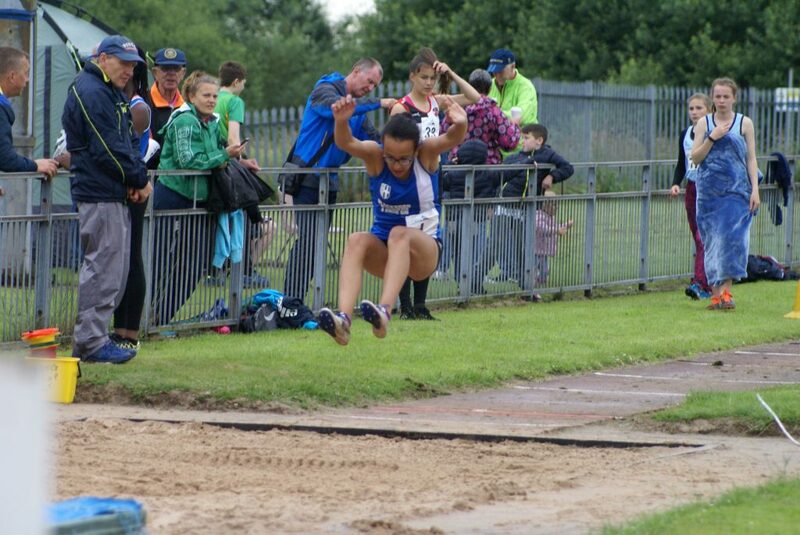 The U15 Girls added a double win in the Long Jump with Baily Madden winning the ‘A’ (4.57m), a new PB by 32cms and Macy Haworth winning the ‘B’ also with a new PB by 16cm (4.46m), whilst in the High Jump Queen Tanimowo cleared a height of 1.30m to take 4th in the ‘A’. 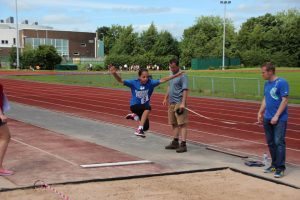 U13 Hayden Mercer jumped 3.92m for the first time in competition in the ‘A’ Long Jump with Kyle Taylor-Pomfret coming 4th in the ‘B’ with a leap of 3.75m – Hayden Mercer went onto clear 1.30m in the ‘A’ High Jump (4th) with Rory Teare pulling off yet another win for the Team in the ‘B’ High Jump (1.30m). 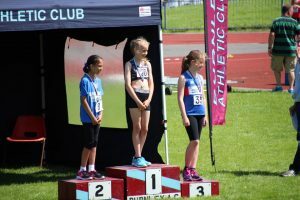 Emma Love jumped 4.21m in the ‘A’ U13 Girls Long Jump to place 2nd which was also a new PB with Shannon Paige 4th in the ‘B’ with a distance of 3.56m – and – in the U13 Girls High Jump Emma cleared 1.30m to win the ‘A’ supported by Danielle Probert in the ‘B’ who cleared a new PB of 1.20m for 3rd place. 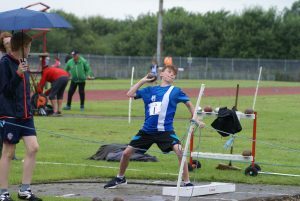 There was a big new PB for Kyle Mashiter in the U15 Boys Shot as he threw 8.35m – up from his previous best of 5.90m to win the ‘B’ whilst Ethan Joyce tried the event for the first time ever and came 4th in the ‘A’ with a distance of 8.51m – George Whittaker came 6th in the U15 Boys ‘A’ Discus (17.52m) and Kieran Carrol 4th in the ‘B’ (17.06m) following that up with a throw of 12.84m in the Hammer (5th) in the ‘A’ and 5th again in the ‘A’ Javelin (23.57m) with new member Harvey Bradshaw placing 4th in the ‘B’ with a throw of 13.61m. 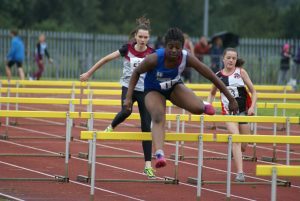 In the U15 Girls there was a double win and new PB’s for Myah Booth winning the ‘A’ Shot Putt with 10.12m and Izzy Thompson winning the ‘B’ with 7.82m – Izzy then went onto come 2nd in the Discus with 21.76m and 2nd again in the Hammer (20.74m). 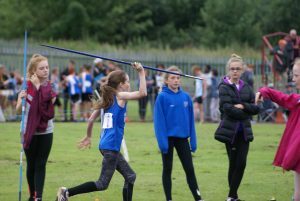 In the Javelin there was another double win for the Harriers, Millie Coy winning the Javelin (28.11m) and Myah Booth the ‘B’ with a throw of 24.03m. 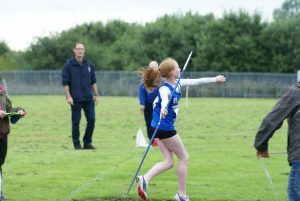 Danielle Probert and Caroline Woodworth were the throwers in the U13 Girls events with Danielle taking 5th in the ‘A’ Shot (5.25m) and 3rd in the ‘A’ Javelin (17.91m) – Caroline placed 4th in the ‘B’ Shot (4.64m) and 2nd in the ‘B’ Javelin (14.74m). 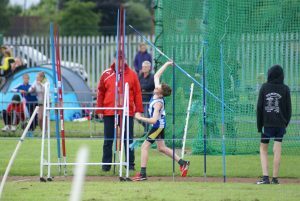 Kyle Taylor-Pomfret came 3rd in the U13 Boys ‘A’ Javelin (22.89m) with Dexta Thompson coming off a real tough battle in the 800m placing 2nd in the ‘B’ with a throw of 18.81m – Joseph Joyce was 4th in the ‘A’ U13 Boys Shot Putt (6.67m) with Reece Simpson 3rd in the ‘B’ (5.92m). 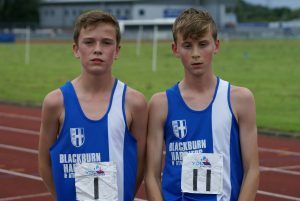 Good runs by the U15 Boys in the 800m but the two North Cumbria athletes who won the races were just too good on the day. 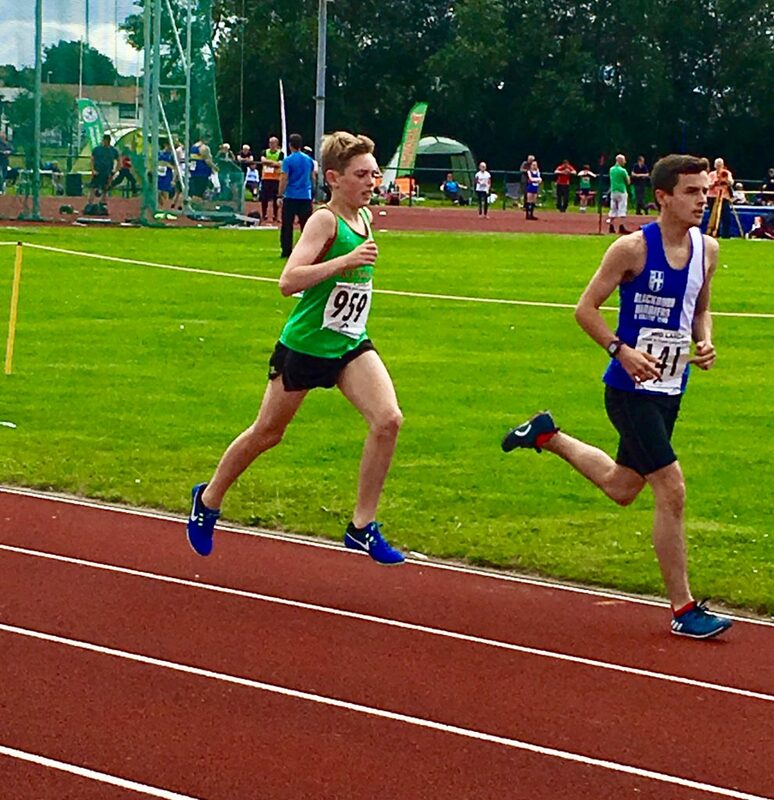 Leon Thomas took the Race on from the gun which probably cost him a little in the closing stages as he finished 3rd in 2.12.4 with Sam Hodkinson who ran an altogether more measured race coming 2nd in the ‘B’ with a time of 2.13.3 – George Whittaker ran a new PB by three seconds (2.31.4) in the non-scoring 800m. 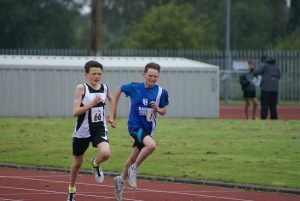 In the 1500m it was a similar story, this time with the Menai athletes just a couple of seconds too strong. 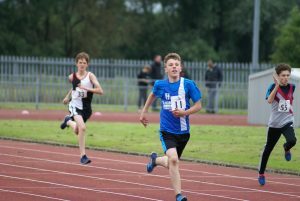 Matt Ramsden had a great run to place 2nd in a new PB time by one tenth of 4.26.3 in the ‘A’ Race as did Jamie Teare who clocked a time of 4.38.2 for 2nd in the ‘B’ also a new PB by two tenths. 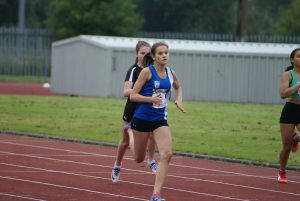 Sophie Stanworth was just a second outside her personal best in the U15 Girls ‘A’ 800m – 3rd in 2.26.1 with Eleesha Charnley 2nd in the ‘B’ in a time of 2.30.5 which is just four tenths short of a new PB. 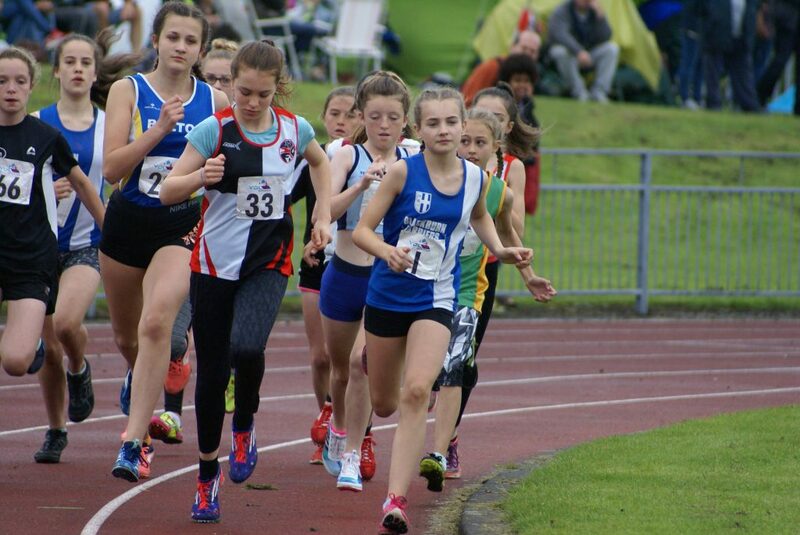 Amy Davies ran to form in the U15 Girls 1500m ‘A’ Race coming in 3rd in a time of 5.03.2 – the winner – 2nd ranked in the country – posting a time of 4.40.3. 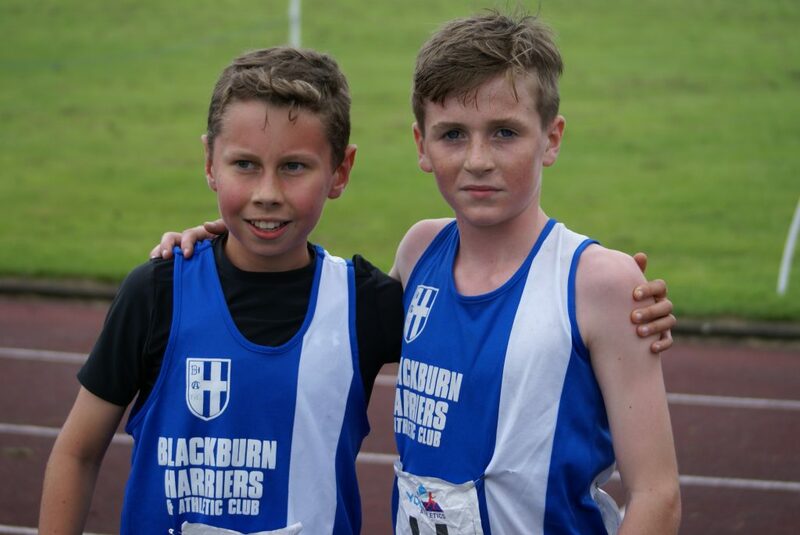 Lancashire County Champion Hayden Mercer came 2nd in the U13 Boys ‘A’ 800m in 2.27.5 whilst Kyle Taylor-Pomfret set a new PB of 2.33.1 in the ‘B’ Race for 2nd spot. 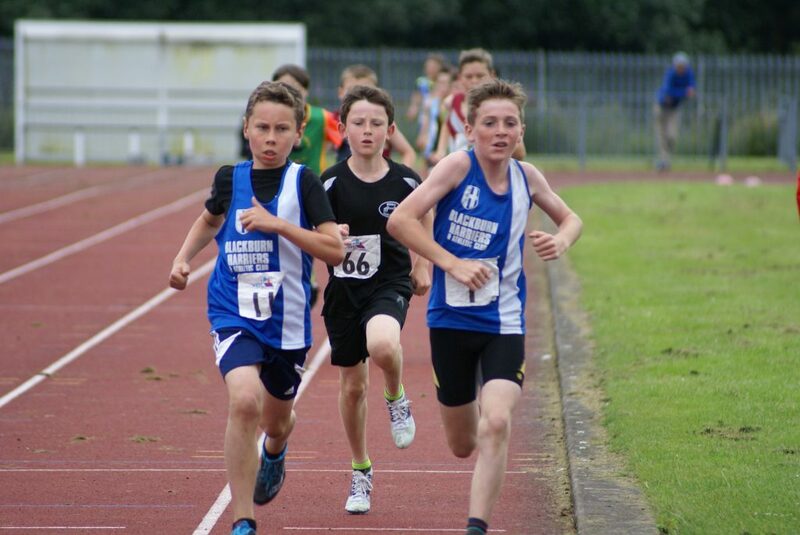 There was a great battle in the U13 Boys 1500m between Dexta Thompson and David Holman. 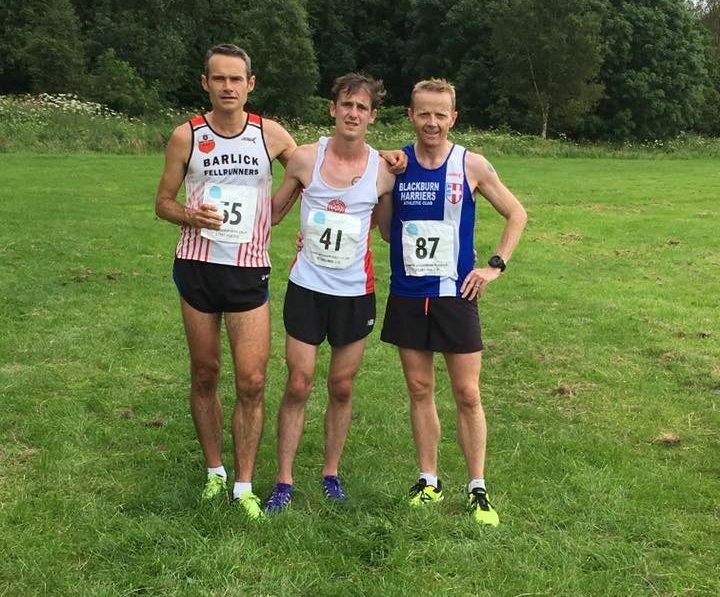 The winner of the ‘A’ Race again was just a bit too quick for the Harriers lads on the day the race evolving into a a ‘dip to end all dips’ by Dexta to just take 2nd in the ‘A’ Race (5.01.2) from David who won the ‘B’ Race in 5.01.3. Enthralling to watch! 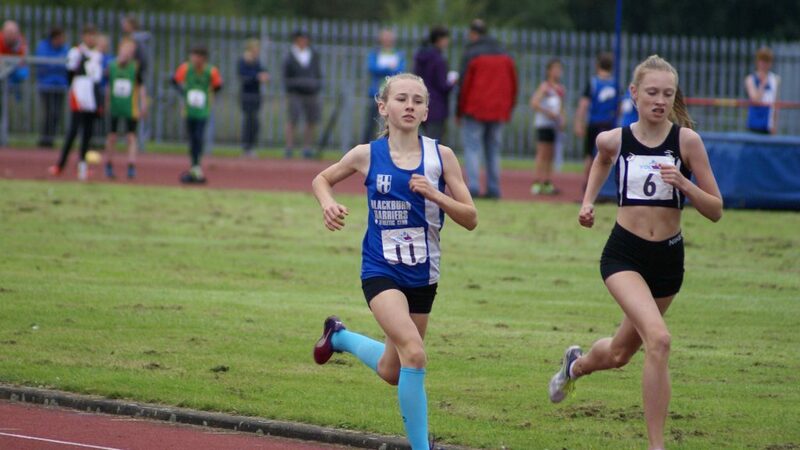 Kate Cookson was running the 1200m for the U13 Girls for the very first time and finished really strong to come home 2nd in the ‘A’ Race with a time of 4.16.4 with Caroline Woodworth winning the ‘B’ in a clocking of 4.19.0 just a couple of seconds behind her personal best. 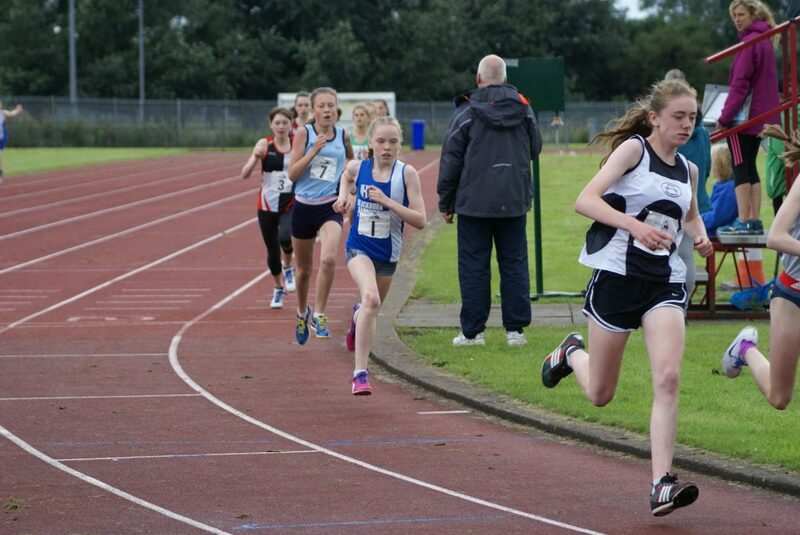 Leah Hoole took 2nd spot in the ‘A’ U13 800m in 2.37.3 with Eleanor Allsop in 3rd in the ‘B’ (2.51.1).